Thanks to Sasha Hoare, the last laureate idea that I had, has seen the light of day. This is a an ‘e-safe’ site for schools and children to post up poetry in performance. The poems can be poems that the children write, poems that are out of copyright, or poems that poets have given permission to schools to use. Please log on and help turn the site – and schools – into places where poetry flourishes. People keep asking me what it’s like to be the ex-laureate and I’m pleased to say that it feels fine. I don’t feel as if someone’s chopped anything off me, I don’t feel kicked-out, signed-off, pensioned-off or put in the sidings. I can’t tell you how pleased I am that Anthony Browne is doing it. And that’s for several reasons: firstly because he’s been a great favourite of my children. I can remember my older ones poring over books like ‘A Walk in the Park’, looking and looking, laughing and laughing, as they started to find more and more new things in Anthony’s pictures. Then, I always like it when children’s books do something new or odd or challenging and Anthony is someone who has dared introduce one of modern art’s great inventions into children’s books: surrealism. Surrealism puts what we think, not just what we see, into pictures. As a result, things that we don’t think of as alike, sometimes sit there side by side within the same picture. Then it’s our job as a looker at pictures to figure out why they’re these things are there together. Or, if you don’t like ‘figuring’, you can just stare at it, and see what kinds of ideas and feelings pop into your head. And that great movement found its way into children’s books, almost solely thanks to Anthony. He’s also a great champion of all drawing and painting. He wants us all to do it. He won’t let us say, ‘Oh I can’t draw. I can’t paint.’ He says just the opposite: we can all do it. I remember him saying to me once in an interview, that we have a lopsided idea of literacy. We think that literacy is only or entirely about reading words. No, he said, we read pictures as well. And this is something we should learn about too. And it’s not helped by giving children rubbishy little ‘hack’ drawings, the kind you get on exam papers, tests sheets and worksheets. That’s just as bad as giving children rubbishy little stories. We should, he said, be giving children the best pictures and art we can find, and we should encouraging children to talk about it. So, I think we’re in for a great time, with Anthony as Children’s Laureate. 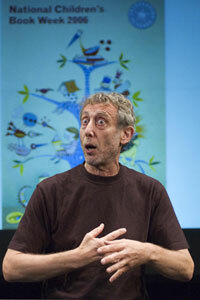 The Roald Dahl Funny Prize was founded in 2008 by Michael Rosen as part of his Children’s Laureateship. It is the first prize of its kind; founded to honour those books that simply make children laugh. The winner of each category will receive £2,500, which will be presented at an awards ceremony in London on 10 November. On November 10 you’ll hear which 2 books we think are the funniest of all, but all 12 are great reads. I hope you will all enjoy reading them, whether you are an adult, a child or in between. After two years of this laureateship, I think I can see that schools are divided between each other, divided between classes within individual schools and even divided within single classrooms. This division is between the children who live in what I’ll call Worksheet Hell, and those who live in Bookland. The last ten years or so has put state primary schools into a state of anxiety: how will we look when the league tables are published in the local newspaper? The route that many schools have taken to deal with this worry, is to spend hours and hours with the children who are seen as ‘slower’ doing what are, in effect, rehearsal papers for the SATs. So where a school thinks most of the children are ‘slower’, then this is what most of the children will be doing. Where a teacher sees a ‘slow’ group, this is what those children will be doing. And what are these worksheets? They are imitations of reading. They are extracts of stories, they are (I quote from one of them) ‘part of a myth’. And the questions that the worksheets ask are about the supposed ‘facts’ of a story, its logic and its chronology. This distorts and wrecks the purpose of reading. It deprives the children of a chance to use their own language to engage with the feelings and ideas that lie in literature. This is going on quite knowingly. I was quoted in my local newspaper for saying these things. This was the reply from a spokesman at the local education authority: ‘…if a class of mixed ability studied lengthy stories in full, many of the children would lose concentration. There is a strong logic to the national curriculum.’ Indeed, there is a ‘strong logic’ and it’s consigning ‘many of the children’ to a life of extracts of stories and worksheets full of dull, pointless questions. And that ‘strong logic’ says that ‘many’ children just aren’t good enough for whole stories. Is this where we’ve got to? Is this the level of understanding that people who run education have reached? In the name of ‘entitlement’ they’ve created a regime of segregation and discrimination. And it is discrimination, because if you deprive children of a chance to learn to love reading and books, you deprive them of access to the easiest and most pleasurable way of getting hold of complex ideas. I think being the Laureate has brought all this into much sharper focus for me, whether that’s been through the school visits, meeting Ed Balls and Jim Knight, attending conferences on reading or making a TV programme on trying to create a book-loving school. In terms of ideas, I wanted to follow in the footsteps of the four previous Laureates and leave some things that could help more and more children find their way to enjoying books. I did a series of performances around the country with other poets and out of that has come an anthology ‘A-Z of poetry – from Agard to Zephaniah’ which will be launched at the Edinburgh Festival in August. Most of the poets who perform their poems in schools are in there. Alongside that, it’s been a treat to create with Morag Styles an exhibition at the British Library – ‘Twinkle Twinkle Little Bat’ – that celebrates the history of children’s poetry. As part of the exhibition there’s been a conference on Poetry and Childhood (a book to follow!) and a series of performances and workshops for the public. On another front, we’ve got the Roald Dahl Funny Prize up and running so that parents, librarians, teachers and children can find their way to the 12 comic books on the shortlist including the two winners. The last bits of the jigsaw are the things I am trying to put in place to encourage teachers to help children enjoy poetry. There’s the ‘Poetry Friendly Classroom’ webpage at Booktrust’s website, which is for teachers to exchange ideas and after the summer there’ll be a website hosted by the London Grid For Learning where children will be able to post their poetry performances. I think the Children’s Laureateship is working. We’ve all brought to it something different. We’ve each found ways to stimulate different parts of the children’s literature process and I’m sure this will go on. 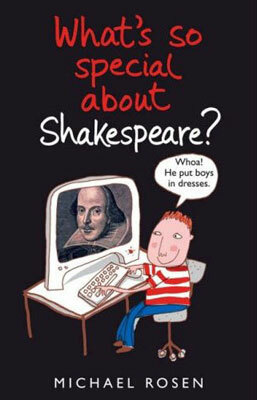 It seems to me that we’re in a new phase in the history of literacy. The artefact of the book and all the different ways of putting things into a book are in a state of flux. Each time a school closes a library to make room for an ITC suite, it represents a moment of change in this history. Each time an education spokesperson says that there are children who can’t cope with whole stories, that too represents a moment of change. If we believe in the value and power of books, stories, poems and plays, we also have to remember that it will never be enough simply to publish good stuff. We have to be committed, ingenious, flexible and experimental in coming up with ways of making all that literature come alive for every single child – no exceptions allowed. I get the impression that a head of steam is building, putting pressure on the government to carry on loosening up the curriculum and to make more space for reading for pleasure. What’s odd, is that it seems to be happening in a rather low key, almost covert way. As I’ve said before, I think we need a bold, clear statement from government that asks every local authority and every school to develop practical policies on how to make their respective patches into book-loving places for all. ‘Just Read’, the TV programme I did for BBC Four, showed that it’s possible. If we don’t get going on this, we will lose school libraries, local libraries and end up seriously discriminating against all children who come from homes where there are very few or no books. These are the children who find school so hard. Reading widely and often opens doors, and one of those doors takes you into formal education. It should be a priority to get every child reading many books and many different kinds of books. It’s the most pleasurable way we know of getting hold of complex and abstract ideas. The first months of 2009 have kept me busy. On BBC Radio 4, two programmes I presented about children’s books went out – one about the 200 year history of ‘Jack and the Beanstalk’ and the other on the Russian ‘Winnie the Pooh’, who is known to Russians as ‘Vinni Pukh’. I’ve also appeared on BBC Four’s We Need Answers’ (a joyously nutty quiz show), ‘Bookaboo’, ITV’s book show for children, Sky TV’s Book Show, ‘The Daily Politics’ and ‘The Wright Stuff’. I’ve also been a judge on BBC’s ‘Off by Heart’, a show about children performing poems. It was down to me to choose the overall winner for the London area and I chose a seven year old boy who performed a poem by Grace Nichols as if it was a rock gospel number. Stunning! Meanwhile I’ve been round and about doing shows, workshops or talks in Orpington, Southampton, Sheffield, Beaconsfield, Upminster, City and Islington College (for a conference on Gaza), Barbican Centre, Wavendon near Milton Keynes (for a poetry and jazz workshop with Tim Whitehead from the Homemade Orchestra), Edinburgh (Scottish Book Trust conference), the Booktrust Conference in London, Newham, Norwich, The Stables in Milton Keynes, Coram Fields, Haverstock School in Camden, Solihull, a conference of Paediatric Anaesthetists in Brighton and the Bernie Grant Centre in Haringey. Meanwhile, my courses at Birkbeck and CLPE run on and I’m working with Hackney teachers on a Year 5 writing project. On the progress of my Laureate projects: ‘Twinkle Twinkle Little Bat’, the exhibition on the history of poetry for children that Morag Styles and I have curated will open at the British Library on 1 April. Do take a look at it – it’s in the foyer and it’s free! The conference on children’s poetry is a sell-out but there should be a book of the papers and talks to follow. The ‘A-Z’ anthology of children’s poets (from Agard to Zephaniah) will be published by Puffin in August. Perform-a-poem, my idea of a poetry YouTube for children will happen with the London Grid for Learning and we’re just gearing up for the second Roald Dahl Funny Prize for the funniest books for children. As a result of last year’s prize, my 8-year old daughter has become an Andy Stanton addict! The National Health Service asked me to write a poem to celebrate their 60th birthday. Here’s how it was reported on the news: British satellite news. BBC News online covers the poem. And here’s how it looks and sounds when it’s performed: Live performance of These are the Hands. 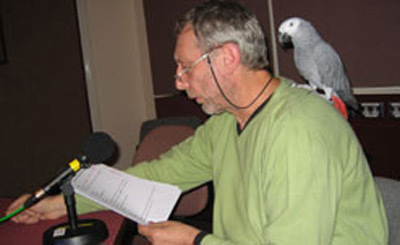 Here are two pics of me and a parrot doing Word of Mouth. 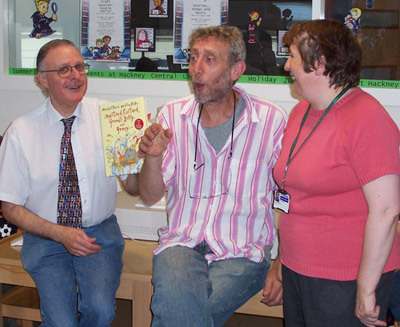 At the launch of Children’s Book Week in October, the Newsround press packers met me. Click here to read the giant poem written by 200 children at the launch. Here’s the website of Basho music with news about the Nonsense and Jazz project and here’s a sample of the music at an early stage in composition and rehearsal. The Daily Mail reported me saying that poetry was being frozen out of some schools. The story originated here in the TES. Here’s the text of the ‘voices-play’ I wrote that went on at the Rosemary Branch Theatre, Islington at the end of October. It’s called ‘Hackney Streets’. This prize came about as a result of a light-bulb moment. I think I was on a train. 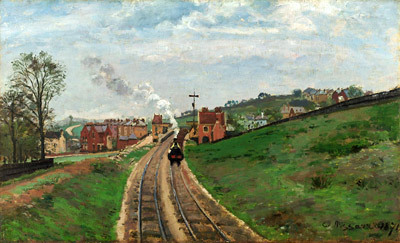 It must have been a train because that’s where I live these days. I was thinking about sitting as a judge for the Guardian Children’s Fiction prize and how for each year I did it, the funniest book of the year, got edged out. I don’t know if she’ll forgive me (not that it was my fault alone), but that’s why Anne Fine didn’t win that year. Oh that’s let the cat out the bag, these things are supposed to be secret. Anyway, I approached the Laureate committee, we all approached Booktrust, we then approached (there’s a lot of approaching going on here, isn’t there?) and the Roald Dahl Estate and – berdoing!!! -that’s what the Roald Dahl estate said – we had a prize, well two prizes in fact and the shortlists were announced in the week of Roald Dahl Day. Humour is no laughing matter. This prize is of course a ‘cunning plan’. We are deadly serious about trying to get every child reading and enjoying books. So the prizes, the shortlists, the fanfares, the balloons (oh we haven’t got balloons, they said the budget was tight) is all about encouraging children to read, families to read together, schools to be filled with laughter instead of SATs (oh that would creep in wouldn’t it?) 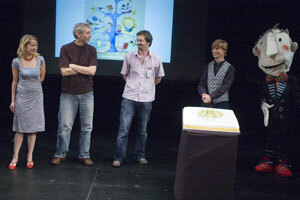 and to reward and encourage authors and illustrators to produce funnier and funnier books. The judging took place one early morning in a café in Charlotte Street. We sat strangely near to each other in a room with a lot of mirrors. There was Kaye Umansky, cackling louder than a kookaburra. There was the frighteningly thoughtful Chris Riddell. There was Dara O’Briain who Kaye thought was there in order to sign his autograph for her daughter. And there was Sophie Dahl to remind us that the best way to decide if a book is funny is to work out if it’s funny or not. It was painful. It was arduous. It was tortuous (largely thanks to me for working out some cumbersome system or other of canvassing views. What a strange thing to do with views…’canvas’ them. Make note: do ‘canvassing’ on Word of Mouth next week. ) It went on so long, Dara fell asleep and talking of falling, he fell landed on his croissant. Nasty. Kaye went for a jog round the block and came back with several geese. Chris started drawing dragons (they’re for sale outside) and Sophie said that we should think about whether the book is funny or not. We noticed that this year, funny books had several themes: they were dinosaurs, pirates and underpants. So far, no one had a book with all three but that’s a challenge for writers and illustrators to take up next year. Captain Diplodocus sails the Jolly Velociraptor through primeval slime, until the dastardly Cutthroat Stegosaurus steals his underpants. I think I’ll go in for this prize next year. Can you be a judge and win it? Well, those are next year’s rules, OK? Well, look, thanks to Dara who, you may not know, has a ruthless streak about him, our deliberations were cut short. Ow! Whenever we dithered, he slashed our dithers to bits. Whenever we procrastinated, he asked us if we knew what procrastination meant. I said it was something to do with whether you go to heaven or not. And from some deep pool of knowing, Dara said, oh no, no, no, no, no, no, no, no, no, no. no….Kaye got the autograph. Chris got some more coffee and Sophie said that we should think about whether the book is funny or not. Here’s an interview with me talking about Pinocchio for Croydon paper. ‘Libraries have played an important part in the cultural and democratic life of this country. We talk of the ‘republic of letters’ meaning that we have created a world in which we share books as equals. This was only possible when books became free, which, thanks to a mix of philanthropy and municipal goodwill, was achieved through the invention and provision of libraries. Now, more than ever, we need this ‘republic of letters’. We live in a time when the main organs of information, entertainment and education (outside of schools) are owned by very few giant multinational corporations. However, within the world of books, there is still more diversity than in any other form of media. In part, this is because of the very process of reading books. Books are portable, durable packages where we can read slowly, toing and froing across the pages at a tempo that suits ourselves. Libraries are the treasure-houses that store these ‘packages’ and it’s here that we can browse for free, to find the books that we want or need to support our lives and interests. I’ve come to think that a key to the survival of libraries is to be found in the links that they should have with schools. In many but not all places, this is casual, informal and patchy. If schools really put books at the centre of the curriculum, the local library becomes an essential part of that process and would prove to those who have the power to slash the library system that libraries are an essential part of our lives. I’ve been doing poetry performances in Winchester, on the Isle of Wight, Bookmarks Bookshop in London, Seven Stories Museum in Newcastle, Southport, the Little Angel Puppet Theatre and St Albans and the poetry and jazz Nonsense project reached the Queen Elizabeth Hall on the South Bank. I also had the experience of turning up at a school with my voice gone. I did wonder for a few hours what I’d do with my life if it became permanent! I’ve finished making a one-hour programme for BBC Four about helping a school become a book-loving place for everyone. It’s called ‘Just Read’ and it’ll be going out sometime in early February. The NHS filmed me along with several celebs performing a poem they commissioned me to write and I introduced a discussion on the French film, ‘Le Ballon Rouge’ at the London Socialist Film Festival. In the latest run of ‘Word of Mouth’ for Radio 4, I had the fascinating experience of going to Newbury Park Primary School in east London where they have a language of the month and a child who speaks that language is recorded talking. This goes up on the school website and the whole school gets involved in activities around that language. One of the most inspiring occasions I’ve been to in this period was the prize-giving of the Sheffield Children’s Book Award. The City Hall was packed to the rafters with children from schools all over Sheffield, waiting to see which of the books they had read and voted on had won. 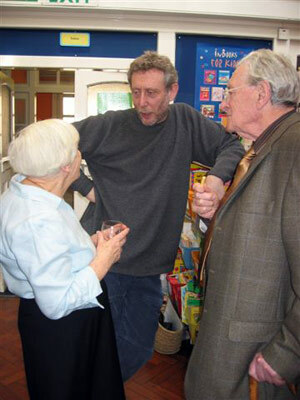 It was the twentieth anniversary of the Award and Martin Waddell, the first ever winner, was there along with many of the shortlisted authors, illustrators and their publishers. 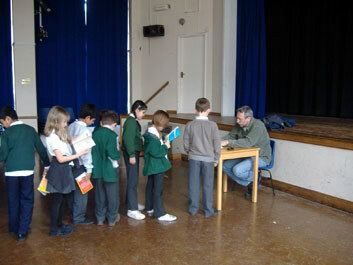 There were wonderful film sequences of the children talking about the books and then afterwards, hundreds of children queued to get their books signed. Halfway through this, my lightbulb went on again: every locality in the country could do their version of the award, with every school and child getting engaged in choosing which are their best books. It would mean cooperation between libraries, the local education authority, schools, parents, bookshops and the Children’s Book Group. Is this possible? What’s needed to make it happen? Anything I can do to help? Meanwhile, I’ve been doing my usual visits. By the way, they are organised by the amazing Jan and Kate Powling at jan@speakingofbooks.co.uk or, when it’s a Children’s Laureate event, by the equally amazing Sasha Hoare at Booktrust at Sasha.Hoare@booktrust.org.uk. It was Sasha who set up an incredible launch for Children’s Book Week at the London Eye, where we had some 200 children up in the capsules and then writing a huge poem at Southbank Centre in which the Eye talks to the Thames. You can read it on the Booktrust website. The National Year of Reading held a conference where I read my NYR poem (find the poem on the NYR website). I’ve begun a scary cooperation with scintillating jazz musicians from the Homemade Orchestra who took my nonsense poems and turned them into a jazz oratorio. We’ve played Newbury, Guildford and the Queen Elizabeth Hall, Southbank Centre. I’ve performed in Rye, at the Bath Festival of Children’s Literature; did three picture book shows with a wonderful Indian writer, Anushka Ravishankar, in Bexhill, Oxford and the Queen Elizabeth Hall for the Children’s Book Show. 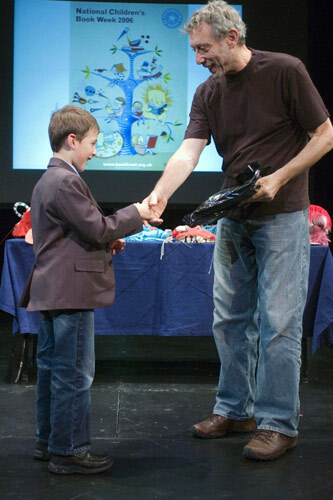 I’ve performed my own shows for children in schools or theatres in Dartford, Telford, the Polka Theatre in Wimbledon, the American School in St John’s Wood, the Cheltenham Literature Festival, Canterbury and Swindon. I took part in a seminar at Birkbeck College on social realism in children’s literature with Kimberley Reynolds and Julia Bell. I was very pleasantly grilled at ‘Connecting Conversations’ at the Institute of Psychoanalysis and at SPACE in Brighton. 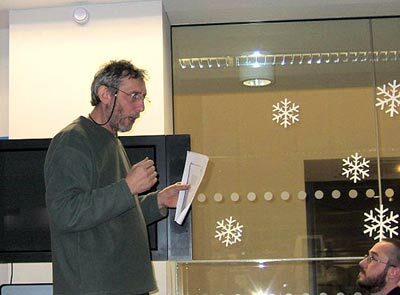 I read at an event for local writers at Stamford Hill Library; spoke on bereavement in Berkshire, read to students at York St John’s University. My yearlong poetry course for teachers at the Centre for Literacy in Primary Education has begun. I took part in a fantastic four days of poetry workshops at the Barbican (‘Can I Have a Word?’) based on an exhibition of photographs from the Spanish Civil War. Laureate projects progress with the British Library exhibition (April-June 2009) and conference (April 20 & 21: enrol now!). The first Roald Dahl Funny Prizes were awarded; the schools’ performance poetry website – ‘Perform-a-poem’ – is being designed at Booktrust and the A-Z of Poetry Tour will become a book with Puffin. A ‘play for voices’ I wrote about my locality, ‘Hackney Streets’, was performed at the Rosemary Branch Theatre and my version of ‘Pinocchio’ is running at the Polka Theatre, Wimbledon. The University of Worcester awarded me an Honorary MA, Birkbeck College made me a Visiting Professor, France made me a Chevalier de l’Ordre des Arts et des Lettres. In between, ‘The Wright Stuff’ (Five) have had me on regularly to do a ‘reading clinic’ – advice for parents on their children’s reading. This is my Dad a few years ago at Margaret Meek Spencer’s Birthday. I’ve been writing plenty of new poems which will appear in a book, provisionally called, ‘Michael’s Big Book of Bad Things’, which in a way, will be a tribute to my father’s way of remembering childhood misdemeanours! I’ve also got straight back into doing visits, so I was up at the Edinburgh International Book Festival, chairing an event about picture books with Polly Dunbar, David Lucas and Catherine Rayner (three of the Big Picture Campaign’s 10 Best New Illustrators), followed by an A-Z of Poetry event with Carol Ann Duffy, her musician John Sampson and poet Tom Pow. I’ve done a couple of local events, first at Hackney Library as part of Team Read, and then at Stratford Circus for the utterly wonderful Newham Bookshop. It was nice to be invited to tell the Society of Authors conference what the Laureateship is all about as well as hear from Alan Gibbons and his great Campaign for the Book. What Alan is highlighting is that under our eyes libraries, library staff and book budgets are being slashed. One point from the conference that really rang a bell with me was when someone said that being able to browse and Google usefully when you’re online depends on the experience of having read widely and often in the first place. Finally, the British Library exhibition on the history of children’s poetry is developing nicely. Morag Styles and I are still wading through wonderful old volumes, including Robert Burns’ first edition of ‘To a Mouse’. Please note the dates of the Poetry and Childhood Conference (20 & 21 April 2009) at the British Library as part of the exhibition, with seminars, lectures and readings by Jackie Kay, Carol Ann Duffy and yours truly. Enrol now! Contact Hannah Drake on hvd21@cam.ac.uk or 01223 767 735. I’ve put myself about a bit in this period! I’ve done shows at the Brighton Festival and on tour in Scotland taking in Edinburgh, Glasgow, Dundee, Aberdeen and Inverness. 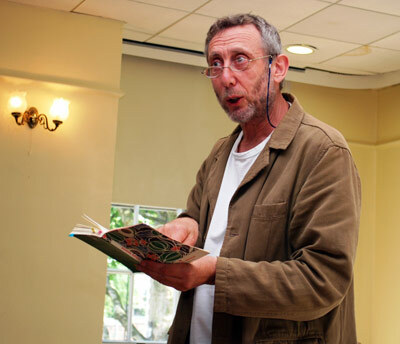 I met the wonderful Jack Prelutsky, the US’s Children’s Poet Laureate for a joint show at the American School in Thorpe and contributed to Write Away’s conference on non-fiction at the Institute of Education. Then, it was on to the Hay Festival followed by a week of performances for schools at the Barbican with Francesca Beard and a wonderful four-piece Jazz group. I visited Liverpool to do two sessions, one for children (A- Z of poetry tour), the other for teachers and joined in the biggest ever collection of poets for children at the Bethnal Green Museum in London for the forthcoming Oxfam CD of children’s poetry. Then it was on to Southampton for their Book Fair, a school near Wellingborough, the Artsmark Award ceremony at London’s South Bank, Holland Park Comprehensive, Camden teachers, a conference for the Centre for Literacy in Primary Education, an in-conversation session with Jackie Kay as part of her receiving the CLPE Poetry Award for the best poetry book for children this year, then on to a secondary school in Nottingham, the Ledbury Poetry Festival with Jackie Kay and Francesca Beard for an A-Z show, a school in Shrewsbury, a day out in Oxford with the finalists of the Kids’ Literature Quiz, a big read-in at Coram’s Fields in Camden to celebrate the National Year of Reading, finishing up with the launch of the Summer Reading Challenge at the House of Commons and a conference at Tate Britain on play. In between, it was good to work at, Brooke Six, a local sixth form college to help the students write, rehearse and perform a poetry show and also at my daughter’s primary school to tell ghost stories at their sleepover and work with the children on writing poetry. I was invited to meet the DCSF Early Years people along with people involved with the National Year of Reading. They suggested ways in which I could support the NYR and the new Talk project they’re launching. I repeated what is fast becoming my mantra: why can’t the government be as committed to the reading of books as it is to the teaching of reading? Or, put another way: why is learning how to read compulsory but reading books optional? Is this a political, cultural or educational matter – or all three? I also joined in a big meeting at the DCMS, chaired by Andrew Motion, on the ‘literature offer’ element for what will be the five hours a week of cultural entitlement in schools. Perhaps this is how the reading of books will sneak back on to the curriculum. I’ve popped up on Channel 5’s ‘The Wright Stuff’ talking to people who phone-in with questions about their children’s reading, I’ve written some more poems – I think a new book is gestating – and I’ve been to production meetings with a new picture book I’m doing with Joel Stewart and the Polka Theatre for my version of ‘Pinocchio’ coming on in November for their Christmas run. Here’s an interview in the Irish magazine ‘Verbal. This is a clip of me on BBC Breakfast TV from some time ago. Here are a few thoughts on poetry. Here’s a clip of me from the BBC’s ‘Daily Politics Show’ talking about reading and arguing with Hazel Blears in the studio afterwards. ‘Give children books, not SATs’ from the Independent. Why we need better arts provision for children – message to the Action For Children’s Arts Conference. Another couple of months busying about: I’ve worked with London children as part of the Barbican’s ‘Can I Have a Word?’ project. We wrote poems inspired by one of the most intriguing exhibitions I’ve ever seen. It was called: ‘Martian Museum of Terrestrial Art’, and it was full of objects, paintings, photos and installations ‘collected by Martians’ (!) from humans. I’ve done shows in Luton Library, St Luke’s School in Canning Town, heard wonderful poems from primary schools in Camden at their local secondary Haverstock, announced the Big Picture campaign’s Ten Best New Illustrators at the Bologna Children’s Book Fair before going on to Rome and Naples to work for the British Council. (Interesting, talking for an hour to fifty Italian children who could hardly speak English!) 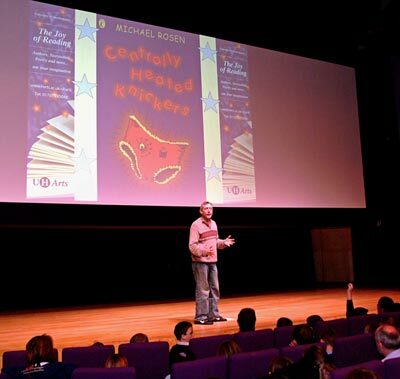 I entertained some four hundred children at Reading Football Club as part of their ‘Reading needs Reading’ project, another five hundred or so at the Rose Theatre in Richmond and visited the Cobham International School. In between, I’ve done some TV – BBC Four are making three programmes about children’s literature and I did some filming for that; I’ve recorded five stories (not mine) for CBeebies and appeared on ‘The Wright Stuff’, Matthew Wright’s morning chat show on Five, where I now have a regular spot offering advice on children’s books to people who call the show. One of the most moving calls came from a woman who said that she was 53 and couldn’t read – what should she do? On radio, I appeared on Five Live to argue about apostrophes, I finished off five programmes for Radio 4 about the legacy of Iona and Peter Opie in relation to their work of looking at children’s play. On Radio 3, I reviewed a new biography of the poet and painter Isaac Rosenberg and carried on with ‘Word of Mouth’ for Radio 4, which took me to Kingsford Community School in Beckton, East London where they teach compulsory Mandarin to all of Key Stage 3. How interesting to confront a prejudice on my part when I found that I was surprised that children who don’t ‘look Chinese’ could speak a Chinese language! The Laureate projects are cooking nicely. 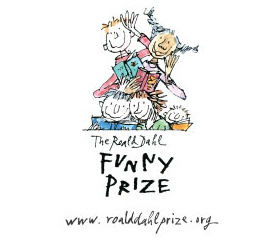 The Roald Dahl Funny Prize is up and running, so if you think you’ve read the funniest book published this year by a British writer, give the publisher a nudge to make sure that it gets entered. I think it’s great that Roald Dahl’s name is attached to this because he was someone who wrote some of the funniest books ever written for children. I’m also chuffed that the bit of my laureateship devoted to being an ‘ambassador for fun with books’ has come to fruition. The exhibition, conference and performances about the history and practice of poetry for children going on at the British Library next year is developing beautifully, thanks largely to Morag Styles, while a set of performances under the heading of ‘A-Z of Poetry Tour’ is carrying on round the country – Liverpool, Edinburgh, Dundee and Bath – and more. Or shall I have Coco Pops? Uh oh…the Coco Pops are on the floor. Uh oh…he’s going to gobble them up. The dawdler and the dodger! Draw a shaving foam face on the mirror. And play on my DS! The best flicker in town. But they all point at me.. They all point at me. 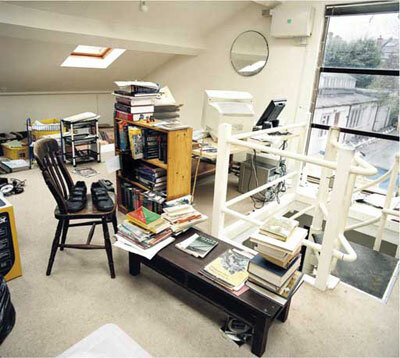 This is my workroom in the series ‘Writers’ rooms’ that runs in the Guardian. The photo is by the great Eamonn MacCabe. Here’s a film of a talk I gave at a Liverpool literacy conference. This is an article called ‘My life in travel’ in the Independent. Since writing last, I’ve visited schools and libraries or done theatre shows in Kent, Wiltshire, Peckham, Finchley, Petersfield, Watford, Camden, London’s South Bank, Twickenham, Basildon, Greenwich and Cambridge. The NUT in Ealing asked me to do a version of the talk I gave in Wakefield called ‘How not to bore the pants off children’. A couple of things struck me: there are some young teachers who weren’t helped in their training (or since) to find a way of getting their pupils to enjoy books. A couple of young secondary school teachers asked me, ‘How can we get our students to enjoy literature?’ Clearly, there is no longer time to answer this question during PGCE and Education degree courses. If anyone knows otherwise, let me know. That said, it was heartening to see some 150 teachers coming to a meeting like this in their spare time. The hunger for a new approach (or is it an old approach?) is there. My view about this was reinforced by a meeting I had with Jim Rose (he of the Rose report). He was satisfied that he had put into place a structure that gave children what he called ‘the alphabetic principle’ (ie synthetic phonics), but he appeared to me to be genuinely concerned that there was no equivalent programme in place ‘to make books come alive’. Indeed. Isn’t that what some of us have been banging on about for the last ten years ? We parted on good terms in absolute agreement on this matter but since then I’ve heard nothing. The other official meeting I had was with Margaret Hodge, Minister for Culture, Creative Industries & Tourism whose responsibilities also include ‘the arts’, heritage, architecture, royal parks, museums, galleries, archives, libraries and science. (I like to get these things right!) It was a curious occasion, because it was several weeks before the Government’s announcement calling for all schools to give children five hours of ‘culture’ a week. However, Ms Hodge invited me and the Booktrust people I was with to think about what was to be announced with particular reference to libraries. How could libraries, she asked us, help ‘deliver’ this ‘offer’? I suggested that the Government’s own initiatives, Creative Partnerships and Cultural Hubs were good models of how to proceed, weren’t they? I thought I detected a certain coolness to this suggestion. If so, then perhaps someone can tell me why. I’ve chaired several big conferences that brought together many practitioners from these two experiments to get schools working with local cultural organisations and there seems to have been some great work going on. Surely they have each created blueprints of how this could work all over the country? The moment the Five Hours of Culture a Week story broke, I was asked by several news outlets to comment and it quickly became clear that no one in Government has actually worked out how the over-stuffed official curriculum can be squeezed to deliver the five hours, nor indeed what kind of organisation will oversee it. However, if it does become official, statutory policy, then presumably Ofsted will be required to ensure that schools are really delivering it. And will schools get any extra money to pay for the workshops, visits, cover for teachers and the rest? We shall see. Meanwhile, there’s progress on my Laureateship ideas – perhaps I’ll leave the detail of that till my next log when, I hope, I’ll be able to report something specific. Meanwhile, the ‘A-Z of Poetry Tour’ has begun. 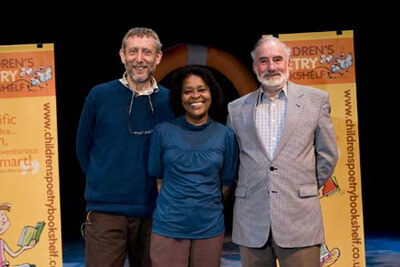 John Agard, Valerie Bloom and I did a show for some 900 children at the South Bank. There is a one-camera video of this, which I’m hoping might become available at some point. On that matter, I’ve made what might be the world’s first online video book. My poetry collection, ‘The Hypnotiser’ went out of print so my son has filmed me performing it. You can find it on my website or on YouTube. 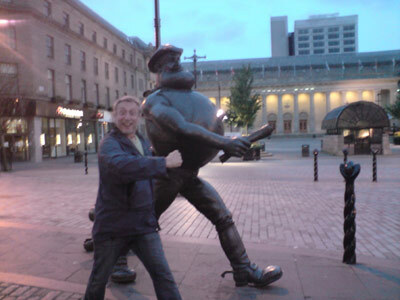 I recently toured Dundee and met one of my heroes, Desperate Dan. 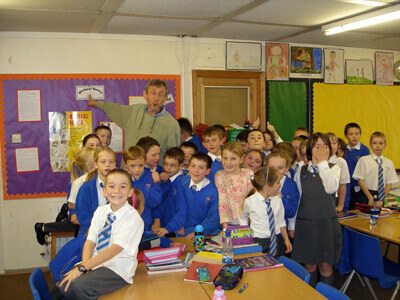 An account of a school visit. 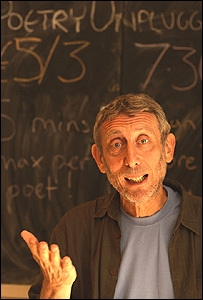 Please don’t forget the Poetry Friendly Classroom webpage – and please send your comments in. Five minute interview in The Independent. An interview with me by Bruce Black at the Poetry Foundation. An article in the Guardian where several of us who help make picture books were interviewed. News of the release of a wonderful album of performance poetry from Apples and Snakes. Rush out and buy it. I wrote a poem! In the midst of the visits to schools, the writing of introductions to books and making radio programmes, I actually found time to think through an idea long enough and hard enough for it to turn into a poem. I thought I had forgotten how to do it. (Not really!) 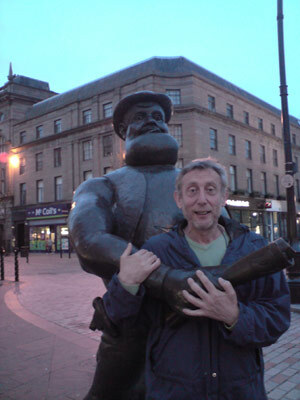 As it happens, I wrote it for Scottish Booktrust as a taster for my Scotland tour in May. Interestingly, it begins: ‘I’m lost, I’m lost…’! The National Year of Reading has begun and I’m very interested to see if this is going to be something that seriously improves the way in which schools help to create people who read books. As yet, I don’t see a match between the effort and energy going into the phonics programme and what needs to be done to make schools into book-loving places. I had the interesting experience of sitting in the TV studio of the ‘Daily Politics Show’ and arguing with Hazel Blears and a spokesman from the Tory Party about the need for school librarians and home-school reading liaison. Needless to say, the moment we started talking about money for this, it was punted into touch. I find it ironic that Monteagle Primary School, which featured on the recent ‘Lost for Words’ series on Channel 4, has a four day a week librarian and its inventive ways of helping parents enjoy books with their children was superb: the reception staff grab the new parents and sit down with them and share the reading of ‘real’ books with them. So, instead of simply saying, ‘reading books is good’, they do something hands-on and practical. Love it. Ofsted have produced a report on the teaching of poetry, I met its author Phil Jarrett and scurried around a few radio and TV shows responding to the report itself. He makes several points arguing in particular that there isn’t a sufficient variety of poetry reading going on in schools. My own view of this is that if you nail schools to SATs and Literacy Hours, you create a school environment in which teachers run as hard as they can to fulfil the requirements of these. What happens with poetry is that many teachers, quite legitimately, feel that they’ve ‘done’ poetry if they do what the Literacy Strategy says they should. But on its own, this is meagre stuff. Poetry offers schools the possibility of uniting people through performance, getting to the heart of personal emotions with private, intimate poems and taking children to the point at which they discover they can manipulate language itself. The Children’s Poetry Bookshelf has expressed extreme disquiet over the fact that publishers have become very wary of bringing out new collections of poetry for children. I can see why: as schools fulfil the minimum poetry ‘norms’, these can be satisfied with one school anthology. At this rate, we won’t see a new generation of poets writing about their world, in the way that I was able to. I’ve carried on with my visits: I’ve been to Nuneaton, Nottingham, Wakefield, Apples and Snakes anniversary celebrations and Crouch End in London. This was a mix of work in a library, secondary school, university, London poetry night and an NUT branch meeting called ‘How not to bore the pants off children’. My visit to Polesworth School near Nuneaton was an absolute delight. I don’t think I’ve ever been to an ordinary comprehensive where the atmosphere was so positive, the work so inspiring. The immediate reason for my visit was to open a language block at the school and to be part of the school saying goodbye to someone I went to school with and who I once worked with during the school holidays in a building supplies yard! This is a day with the winners of the Children’s Poetry Bookshelf poetry competition with poets Valerie Bloom and Wes Magee. 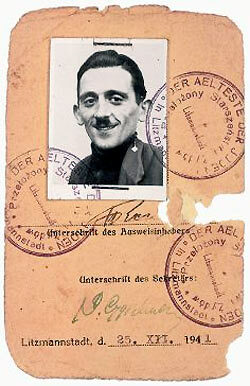 This is the George Orwell Lecture that I delivered on December 6 2007 at Birkbeck, University of London. Since I wrote last, I’ve visited schools and festivals and done performances in Chingford (London), Chesterfield, the Italian Institute in London, Guildford, Belfast, Sheffield, Bedford, Croydon, Kings Lynn, the Tricycle and Soho Theatres and Bookmarks Bookshop in London and a Stop the War benefit in Hackney. I’ve done three days of poetry workshops as part of the ‘Can I Have A Word’ project at the Barbican, given the Patrick Hardy Lecture for the Children’s Book Circle (to be published in the ‘School Librarian’ and on www.michaelrosen.co.uk), chaired the Arts Council conference on the ‘Cultural Hubs’ project, taken part in a discussion about children’s literature organised by PEN, helped judge the Children’s Poetry Bookshelf Competition and presented the award for the Best TV writer for children’s programmes at this year’s Children’s BAFTA ceremony. We’ve been pushing on with my eight Laureateship ideas. There will definitely be an exhibition at the British Library on the history of Children’s Poetry and I’m working with Morag Styles on that. We’re working on the idea that there’ll be a conference and performances running alongside the exhibition and a conference – scheduled date: first part of 2009. The A-Z of Poetry tour will kick off with a show at the Queen Elizabeth Hall on 14 February as part of the Imagine Children’s Literature Festival. The Patrick Hardy Lecture was very much in support of Booktrust’s ‘Big Picture’ Campaign and we definitely have progress on putting together some kind of ‘Funny Prize’ for the funniest children’s book of the year. The interactive webpage for teachers to talk to each other about poetry-friendly classrooms is proceeding apace. I’ve done some filming for that and I’m hoping that that’ll be up and running by January 2008. The other projects are proving to be a bit harder to get going. I’m also hoping that off the back of the Patrick Hardy Lecture we can get together some kind of bank of ideas on how schools can help create book-loving environments both in school and in homes. I’m working with Booktrust on this. My argument in the lecture was that the Government seem particularly keen and thorough to stipulate exactly what should go on in Key Stage 1 classrooms in terms of what they think is the best method to teach reading – Synthetic Phonics – but do not seem equally keen and thorough to stipulate a series of specific ways of encouraging the circulation and reading of ‘real’ books. Why not? I’ve carried on doing my Radio work which has meant finishing the series on the past, present and future of European languages for Radio 3 (‘Lingua Franca’), presenting ‘Word of Mouth’ for Radio 4, including a fun programme about children’s playground songs and rhymes with Dan Jones and a special on the languages crisis in Belgium. Also coming up is a programme about the 200th anniversary of ‘Jack in the Beanstalk’ featuring amongst others, Brian Alderson and another on humour under totalitarianism. As you can see, no day is the same as the next, so my days end with me looking in my diary to see what I’ve got to do tomorrow. And, yes, I have once had the nightmare experience of not opening the diary till the morning only to realise that I should not have been sitting reading my diary. I should have standing in front of two hundred children doing ‘Chocolate Cake’ ! A flurry of phone calls and some pathetic grovelling managed to shift the booking to two days later. By the time I arrived, I was forgiven. Two pleas: may I not be so inefficient again. If I am, may the victims be as gracious as the teachers at St Mary’s, Chingford. People have sometimes asked me about Hackney and Dalston where I live. Here’s a website that tells the story of some things going on nearby with one or two tiny contributions from me added to the ‘Comments‘. Bookmarks Bookshop have published a book of my poems selected from the political poems I’ve written over the last few years. All proceeds will go to helping the Bookshop stay solvent. Here’s how they’ve billed it. First thing to say, is that I’m enjoying myself. I’m only mentioning that because many kind people have been worried that I might be drowning under the pile of work involved. No drowning, no need to worry! People outside the book world ask me, what does being the Laureate mean? What do you actually do? What does a Laureate’s day look like? 1. Wouldn’t it be great for children and poets to have an interactive youtube-like poetry website? 2. We could have an interactive webpage for teachers to talk to each other about making poetry-friendly classrooms. 3. There could be Children’s Literature Trails all over the country. 4. 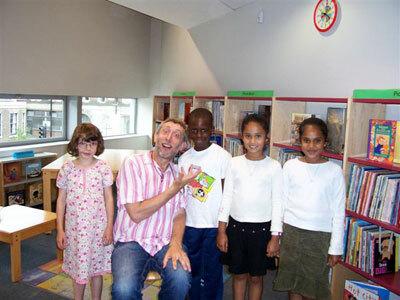 It would be good to have a children’s poetry roadshow: ‘The A-Z of poetry, Agard to Zephaniah’. 6. …a conference on the history of children’s poetry. 7. The Booktrust’s ‘The Big Picture’ campaign for picture books is something I really support – and will. 8. Why isn’t there a Funny Prize for the funniest children’s book of the year? Now, each of these ideas needs plans and meetings, so we’ve sat in twos and threes at various times looking out over the river at the South Bank, munching curry near Oxford Circus, looking at the roofs from the fifth floor of Waterstones in Piccadilly, or drinking coffee in the British Library café. We’ve made progress on all eight ideas. Funding is a problem for the interactive website but the poetry-friendly webpage is on its way. A document is being written for the Trails. Hay Festival is putting its weight behind the Poetry Roadshow. 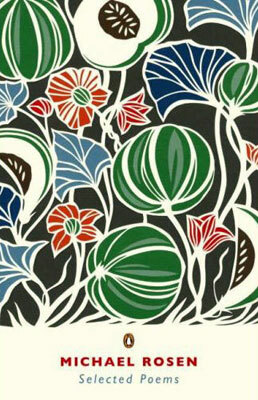 The British Library have said yes to the exhibition, the conference is less certain at the moment. 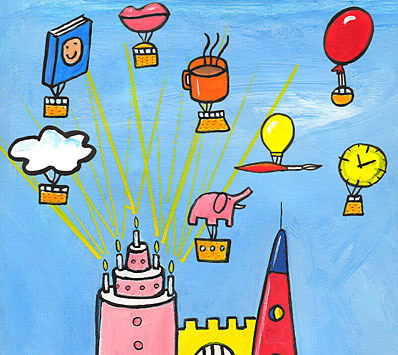 The Big Picture has been launched and Booktrust are pressing ahead with The Funny Prize. Meanwhile, I’ve been interviewed many, many times. Interesting, probing questions about poetry in education, the language and literacy curriculum, picture books, the schools I went to, my parents, my children, my trousers and much, much more. Then there’s been my first Laureate Event, which was a talk I gave called ‘What is a Bong Tree?’ This was about the kinds of questions we ask children to answer about poems. The answer to the question, ‘What is a Bong Tree?’ comes at the end of the talk, so you can scroll straight to there if that’s the bit you really want to know. Who knows, it might come up on ‘University Challenge’. I’m not sure that my answer will be of much help, though. It was great to help launch The Big Picture campaign to promote and champion picture books at the Early Book Awards. We have a serious task of saving the picture book from being squeezed out of the market by schools and parents rushing to buy phonics books and booklets full of ‘English’ exercises. I think that this is going to be the big challenge facing children’s books over the next ten years. In the meantime, I’ve had a great time doing my usual things, helping to make ‘Word of Mouth’ for Radio 4, visiting schools and book festivals and running workshops. I’ve had a fantastic time at Brook Sixth Form in Hackney where I live. I wrote a kind of ‘Under Milk Wood’ ‘voice-play’ about Hackney, and the students rehearsed and performed it to a public audience at a local converted chapel. The 20 or so performers stood round the edge and the audience sat or stood in the middle. I’ll put the text of the play up on my website. Coming up I’ve got a whole raft of bookings and appearances which you can check out on the Booktrust website or on mine. And you might see me pop up on Matthew Wright’s morning show on Channel Five talking about…yes, books for children. Starting on September 14 at the Little Angel Theatre in Islington, London is a show that I helped devise. Here’s how it’s being billed in LondonTown events guide. Please come, I think you’ll have a terrific time. Just in case people confuse me with any other Michael Rosens (and there are many) I’ve posted on to the Wikipedia entry under ‘disambiguation’ a list of other Michael Rosens. 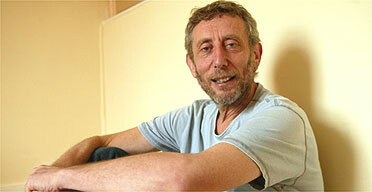 The comedian, Dave Gorman, once did a great show where he chased up all the Dave Gormans he could find. Looking down the list of Michael Rosens I feel tempted to do the same. 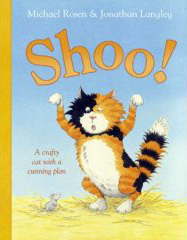 Just out is ‘Shoo!‘ which is a follow-up to ‘Snore’ and ‘Oww!’. Soon, Harper Collins are going to put all three together along with some toy animals all together in a pack. 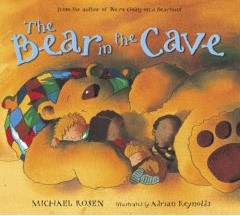 Coming out very soon is ‘Bear in the Cave‘ which is a sort of follow-up to ‘We’re Going on a Bear Hunt’ and there’s a CD of me reading it. Also in the pipeline is the paperback of ‘Mustard, Custard, Grumble Belly and Custard’ and in production is a picture book I’m doing with Nick Sharratt. A kind contributor to the BBC’s ‘Word of Mouth’ message board, told me that I was a question on University Challenge! The question seems to have been: ‘Who wrote ‘Don’t Put Mustard in the Custard’ and…’ Then, Braithwaite from Worcester College, Oxford buzzed. Paxo went on: ‘…and is the present Children’s Laureate?’ I think that’s one of the few questions on University Challenge I might have been able to answer. As if one laureateship isn’t enough, I’ve been made into the London Borough of Hackney’s one-month-long Poet Laureate, doing workshops, chairing some events and writing a specially commissioned piece which will be performed on September 26 all as part of the Write to Ignite Festival. 1. An interactive poetry-performance website for schools. 2. An interactive webpage for teachers to talk about making poetry-friendly classrooms, which you will soon be able to find at Booktrusted. 3. Children’s Literature trails around the country. 4. Supporting Booktrust’s ‘The Big Picture’ campaign for picture books. 5. 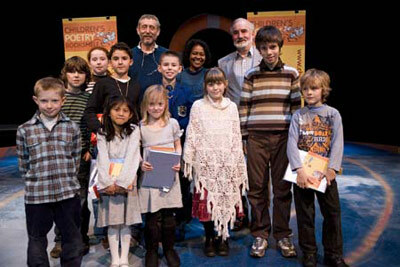 A children’s poetry roadshow, provisionally titled ‘The A-Z of poetry, Agard to Zephaniah’. I’m honoured and delighted to have been made Children’s Laureate. I’m very busy at the moment, so what I’m going to do here is give you as many links as I can to the interviews and broadcasts that I’ve done. I wouldn’t be standing here if it hadn’t been for the work, help and kindness of many, many other people. This will be a constant reminder to me that whatever work I get into as the Children’s Laureate I should cooperate with all the other people and organisations pushing in the direction of making reading a delight and inspiration for young people. Part of the great achievement of Quentin, Anne, Michael and Jacqueline is that they’ve created paths and networks throughout the world of books for children which the laureates coming after them can use. A special word for my immediate predecessor: Jacqueline is someone who writes books that fascinate millions and millions of readers. Her appearances make waves. She has created characters, scenes, moments and plots that have taken the thrill of reading to children of every kind. To pursue her aims of getting everyone to enjoy reading, all she needs to do is go on writing. The fact that she spent time and energy doing so much more than that has benefited everyone involved in writing, publishing, distributing and of course reading children’s books. It’s a fantastic privilege to be following her and the previous laureates who I hasten to add haven’t hung up their laurel crowns in the shed but go on and on drawing, writing, talking, visiting and helping new projects like the wonderful Seven Stories Museum in Newcastle or the forthcoming Museum of Illustration in London. Another privilege I have to mention is that I was brought up by two special people. It’s that moment when one of my children say, or the older sons and step-daughters said in the past, ‘Read to me, Dad,’ that I have felt most acutely how it was the hours and hours my parents spent sharing stories, poems and plays with my brother and me that got me into this whole malarkey. They were both teachers and a two-way street ran between our bedroom and their classrooms. My old copy of ‘Peter Rabbit’ has the stamp of Harvey Road Primary School on the endpapers, not because my mother nicked it from the Harvey Road store cupboard but because she filched it off my shelf and took it into school. It was her who took me to see the folklorist Alan Lomax take us on a trip across the USA with the songs of working people in Joan Littlewood’s stage-show ‘The Big Rock Candy Mountain’. She took me to the world of British Columbia with the stories of Ernest Thompson Seton, to Latin America with a book called ‘Miskito Boy’ and to the fight against the nobility in Geoffrey Trease’s ‘Bows Against the Barons’. And it was also her who, in the midst of her daily work in a primary school classroom, started to write and present poetry programmes for BBC Schools Radio. And it was me who used to look over her shoulder and wonder if I could have a go at writing this poetry stuff. And went on night after night until it was finished. It was the pair of them kneeling on the floor alongside that wonderful teacher and anthologist Geoffrey Summerfield as he laid out on the carpet of our front room hundreds and hundreds of poems, proverbs, songs, litanies and jokes from all over the world for what would become the great ‘Voices’ anthologies that helped me realise that I really could do this poetry stuff. It was my brother in our bedroom at night waving his arms and doing all the funny voices of Geoffrey Willans’ subversive ‘Down With Skool’; the whole family in tears of laughter watching Peter Ustinov or us going to see my father’s productions of school plays that helped me make the connection between writing and performance. And it was two women formed in that 1940s and 50s intellectual tradition that loved and championed serious literature for children who first found a space for me in Schools Radio and Children’s books: Joan Griffiths and Pam Royds. I remember their work and their commitment to new and old, popular, high-quality multi-cultural children’s literature when I look at where we are now. This historical moment for us in our work is at one and the same time inspiring and difficult. Two facts: the sales of both children’s picture books and original single-authored collections of poetry for children are dropping fast. Why should this be? I suggest that the root cause is the same: many – not all – primary schools feel that they are no longer able to make reading a matter of free, wide-ranging exploration. Instead, reading in many but not all schools starts off by being something that has to be done quite explicitly without the use of books, followed by being something that is done when you read a reading book not a book, followed by being that thing you do when a teacher has some questions to ask you about what you have just read. I think there are many consequences. Here’s one tiny indicator: the spinners in the corners of newsagents used to be full of Ladybird books and tie-ins from movies. They are now full of spelling, punctuation and grammar drills. I hope in my time as laureate to go on doing what I’ve been doing for thirty years: going into schools, libraries and theatres to share with children what I’ve been writing; working with children helping them to write; meeting teachers on courses to talk about ways of writing and ways of enjoying reading poetry; teaching children’s literature in universities. I would like to look at how the reading of poetry can be saved from the vice-like grip of the literacy strategy. Please let’s remember: poetry can take us to places of our deepest misery, our greatest joy, to the exceedingly silly, to the foot-tapping heart-stopping wonder, to moments of unexplained melancholy. It can make the familiar unfamiliar and the unfamiliar familiar. It can be chanted, sung, yelled, whispered, read quietly to yourself, mimed, illustrated, danced to, filmed or accompanied by sounds that charm the ear. If you don’t believe me, come and see hundreds of London children working with squads of poets year after year in the Barbican Education’s ‘Can I Have A Word?’ project. I’m hoping to work with all the agencies that provide live poetry experiences for children and perhaps add to them: so, for example, from the head of my son Joe comes the idea of using the technology of youTube to create a website where poets and children in schools could share their poetry performances; to work with the Book Trust to create a page on their website where we can all contribute ideas on how to make poetry-friendly classrooms free of closed-ended questions about similes, and why the effects created by the poet are effective; to get some kind of show on the road round the country packed full of poets. Why not The Poetry A-Z Show, from Agard to Zephaniah? I’m hoping that I can convince the British Library and other libraries round the country to put on exhibitions that celebrate the fantastic history and present-day diversity we have in our books of poetry for children. The BL, after all, has in its possession a unique gem: the world’s only complete copy of what is the world’s first collection of nursery rhymes. I have a provisional slogan for all this: ‘Diverse verse for all’. Again: the picture book is a unique, intricate and massively various art form. It offers families and classrooms a space in which ideas and emotions can be pored over, questioned, discussed and felt. Picture books are the fuse that lights our awareness that reading is full of intense pleasures. If schools aren’t the places where a huge range of these small works of art are to be discovered, many children will never find their way to this pleasure. With this in mind, I’m looking forward to working closely with the Book Trust’s initiative ‘The Big Picture’. On a broader canvas, I’m hoping to kick off something which I’m provisionally calling: ‘Children’s Literature Trails’. Hans Christian Andersen came near to where I live in Hackney to have a row with the woman who first translated his tales into English. Did he get what was owing to him for ‘The Tinder Box’? Down the road Anna Laetitia Barbauld fought against slavery and wrote one of the first reading books for very young children for her own son whilst Anna Sewell grew up in my street and nearby before moving back to the county of her birth, Norfolk where she would write ‘Black Beauty’. Did Anna Sewell read Anna Barbauld? Every area has its connection with books and writers for children. I’m hoping to work with the Book Trust, Tourist Boards, libraries, education authorities and anyone else interested in coming up with some lively materials that will give families and schools places to visit all over the country, books and poems to read and fun activities to get involved in. In just a moment, I have an important announcement to make, but before I do so, can I say, that the next two years will involve all kinds of sacrifices and extra work from one person I haven’t mentioned: my wife Emma. I’m hoping that there’ll be some occasions when our two children will be able to have some fun on laureate days too. Come to think of it, if they’re not enjoying themselves then there’s a good chance that others won’t be either. I owe them and my older ones a great deal for the way in which they’ve given me motivation, a first audience, devastating criticism and – it must be said – ideas. The Department for Education and Skills (DfES) is funding a new national programme called Booked Up aimed at encouraging Year 7 children to read for pleasure. Every 11 year old in England in Autumn 2007 will be able to choose their own free book from a list sent to their school. The scheme will also provide an accompanying website, children’s magazine and a range of add-on activities. The books will be delivered to schools in partnership with distributors Red House. If you want to know more, please talk to Katherine Solomon at the Book Trust. Meanwhile, the DfES is also supporting the expansion of the current Booktime programme for every reception child in England, giving children the gift of a book pack shortly after they start school with a guidance booklet for parents and carers on shared reading. The book for this year is ‘Funnybones’, by Allan and Janet Ahlberg, published by Puffin. I’m more than happy to support the handing out of good books for free. The Guardian’s take on it. A short interview with the BBC. A longer piece by the BBC. The write-up in Guardian Books. A piece on British Satellite News. A longer piece by the Guardian. A piece by the BBC’s Newsround. A longer article by Newsround. Comments on the announcement on Word of Mouth’s message board. The Guardian’s The Blog disscusses my appointment. They are both published as cheap black and white paperbacks with cartoons, speech bubbles and a very accessible look. The other book that’s out is my Selected Poems from Penguin. It includes poems from the three prose poetry books I did with them, along with some poems from the children’s books, and some new ones. I’ve edited it so that it follows a sequence in time from my early childhood up till now, so in a way it’s a chronologically ordered autobiography in prose poem form. I’ve said this elsewhere but having children going through the primary school system stirs up things all over again. There is a basic misunderstanding or deliberate misconstruing of the purpose and importance of stories by those who have designed the primary school curriculum and the SATs tests. 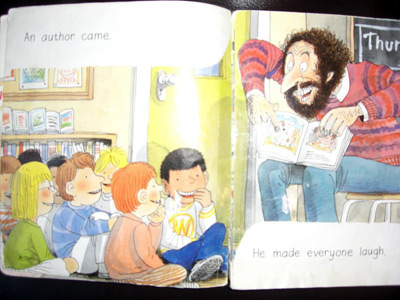 The authorities demand that teachers ask children to do work on retell stories stressing the importance of getting the sequence of the ‘main events’ in the right order. This exactly reflects the kinds of questions asked on the SATs papers that focus almost entirely on the sequence of events in a story, the apparent logic of why this or that happens and a general obsession with observable empirical facts in a story. I suggest that this completely misunderstands why and how stories matter to us. Stories set up situations, scenes, characters and moments that play with our emotions. This play of emotions involves an ebb and flow of feeling on our part. We express or feel a complex set of emotions towards, against, for and with these situations, scenes, characters and moments. This is how literature works. If we don’t have these feelings, the story, poem or play won’t matter. It won’t work for us. I suggest that what schools should be doing with stories, poems and plays is encourage children to explore this set of feelings; to enquire how it is that authors help create these; how it is that we ‘conspire’ with authors to help them. This involves a completely different set of activities from the ones presently on offer in school. It requires that teachers are not forced to ask questions of children that they, the teachers, already know the answers to. Instead, the only questions they might ask are the ones that they don’t know answers to: does this book remind you of anything you’ve ever read, seen, heard, felt before? How? Why? If you could ask any of the characters in the book and/or the author some questions, what would you ask? Can anyone in the class have a go at answering these questions? If one of the characters in the book had to tell someone what was going on in a given scene or moment what would they say? How would you or another character respond? Questions such as these encourage children to engage with this free flow of feeling that I’ve described. Questions addressed to the author can be followed up in a more factual way using reference books and the internet. There’s no need for the teacher to be the sole authority on the matter. Further, books and stories are ideal for other activities within the expressive arts: performance, art, music, pottery, dance, mime, film, photography. The use of these is much more in spirit and in tune with what stories are about then this nonsense about recreating stories in the right order. If that’s all stories were they would be no different from factual reports or accounts of science experiments. Apologies, but this is the talk I gave for my inaugural lecture at Middlesex University when they made me a Visiting Professor. Parts of it were published in ‘Books for Keeps’, so I was laying off putting it on here. Anyway, here it is in full apart from the stories I read from, as they’re under copyright. If you would like to listen to the programmes I did for Radio 3 about the roots of European languages, you should be able to find them here. Scroll back to March 19, March 20, March 21 and March 22 2007 and you should be able to listen to them. 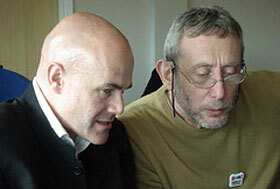 Regular visitors here will see that the website has had a bit of a revamp thanks to the site’s great engineer, Mark. I’ve had to get rid of the Chatroom. Too many people were posting up stuff they wanted to sell and obscene material. So, if you want to get in touch with me, there’s the email address at the top of the site. Other things to look out for are the index of all the old stories from previous posts and the pages that you can click on across the top have been simplified. If there’s anything you think I should include or have missed, do let me know. I was doing a talk to science teachers when I happened to mention that it’s my intention to leave my body to London medical schools. The Times Educational Supplement then cooked up the idea of writing up my talk accompanied by a photo of me posing as if I was about to be dissected. 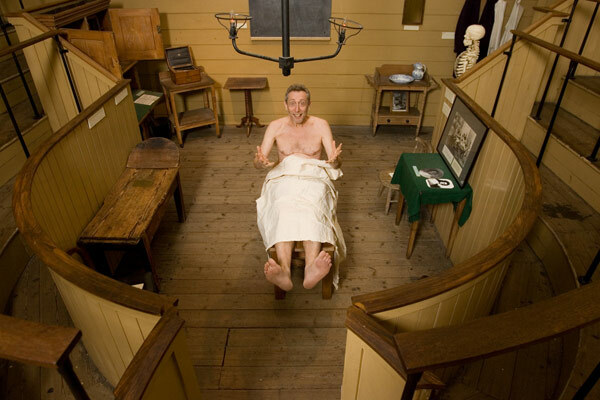 So here I am at the Old Operating Theatre Museum in London, which as it happens is a fascinating little museum on the history of medicine. Thanks to Neil Turner for allowing me to show the pictures here. When my daughter was young she invented a word for when you put your coat on and the sleeves of your jumper get caught up inside the sleeves of your coat… “flaggered up.” I’m not sure if there is already a word for this action, but our family has always used my daughter’s phrase. John Ramsay said that someone who preaches protection of the environment but who nevertheless drives everywhere and flies off on exotic holidays several times a year is an ‘eco-crite’. MEDIOCRACY: a perverse system of authority whereby power is vested in those who are less competent than the people they rule. This could apply to national government or, say, a broadcasting organisation. Although you may think it is simply a synonym for ‘management’. There were hundreds more. Wonderful stuff. New series starts in April. Eddie, my son, died in 1999 and we’ve set up a stone for him in Highgate Cemetery and his ashes are underneath it. It has his full name, Eddie Steele Rosen, his dates: 1980-1999 and on the back a quote from a poem my father, Harold, wrote for the funeral: ‘Larger than life’. If you want to visit it, drop me an email at the address at the top of this site and I’ll tell you where it is. I’ve just spent a fantastic four days working with the team from the Little Angel on a play that celebrates the theatre’s fifty years anniversary. It is in many ways a tribute to the theatre’s founder, John Wright. The play is funded by Heritage Lottery money and will be shown (entrance free) to some eight thousand children in venues all round London and the South-east. We planned out the play in an extraordinary little dive, next to West Hampstead tube station. It was once an old ticket office, but is now a ‘creative work space’ run by an outfit called ‘Metal’, which I believe is itself run by Jude Kelly, who used to be with the Yorkshire Playhouse and is now heading up the cultural side of the Olympics. Interesting place to plan and plot out a theatre production! Every two minutes a train pulls up outside the window and every ten minutes or so a fast train from or to Marylebone roars past about four feet away from where you’re working! 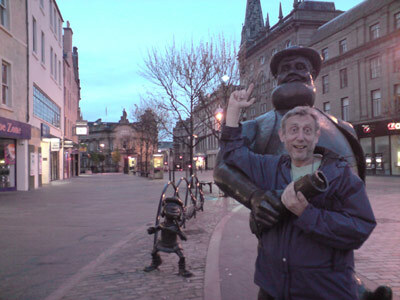 Anyway, never mind that, one of the puppeteers working on the project is the great Ronnie Le Drew. Has the name rung a bell? 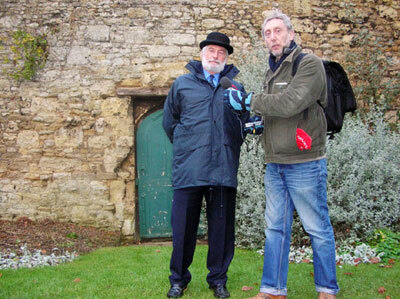 No, not Ronnie Drew from the Irish folk band, The Dubliners. Altogether different bloke. Ronnie Le Drew for many years played Zippy in ‘Rainbow’. Yes, Zippy! I can’t think how long it is I’ve been doing incredibly bad take-offs of Zippy, especially one where I act out Zippy getting his zip done up and then I end up spending four days working with him! Well, not exactly Zippy himself, but the voice and hand behind Zippy. Ronnie is a great guy and to watch him moving these marionettes was an honour. He can make them look as if they’re thinking, Stunning. Anyway, the show goes into proper rehearsal in May and will be in the theatres in June. I haven’t exactly written it. 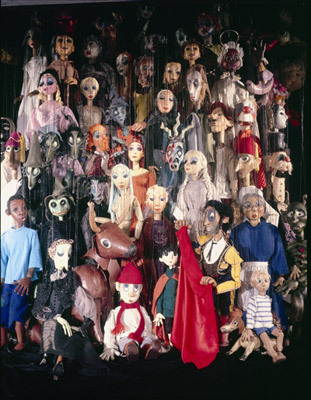 It was a collaboration between all the puppeteers and several other Little Angel people and myself. One gag I was quite pleased with is when Ronnie, as himself, turns to a boy puppet and says, ‘What do you think of the show?’ and the puppet says, ‘No, I don’t like it very much. I don’t like puppets.’ A puppet saying that he doesn’t like puppets. I love it. Here’s one of those interviews where they ask you things like ‘Marmite or Marmalade?’ They seem to have found a photo of me from 43 BC. This is an interview I did for the poet Ian McMillan’s Writing Lab for Radio 3 and the Open University. It’s my thoughts on writing poetry. Walkers are doing a revamp on my Dickens and Shakespeare books. They’re coming out as black and white paperbacks with cartoons and extra gags. Collins are bringing out a sequel to Snore and Oww!. It’s called Shoo! and I’ve seen the colour proofs. Looking great. Terrific work from the artist, Jonathan Langley. Penguin are bringing out Selected Poems based mostly on the three books of prose poems I did with them, plus some re-written poems from the children’s collections plus some new ones. 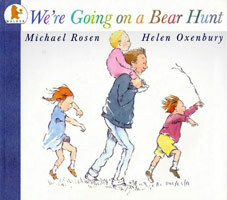 A book called Bear’s Day Out plus CD is coming out with Bloomsbury. I’m making two DVD’s of me reading my poems. They’ll be quite simple readings with me and a few books. They’re being made by my son Joe and his company The Picture Press, and will be distributed by TTN. I’m writing and presenting a 12 part series on European languages called Lingua Franca for Radio 3. It’ll be in three sections of four, the first being on the origins of European languages, the second four being on borderlands and extinctions and the third four being on the future. I’ve started doing the interviewing and it’s absolutely fascinating. Incredible stuff. Do you know why Romania ended up speaking a romance language? Because south Italian farmers and peasants migrated there. It wasn’t because of Roman conquest. I’ll be making a Radio 4 programme about the two hundred year anniversary of Jack and the Beanstalk. We recorded some interviews at the production in Richmond. I’ll be making a Radio 4 programme about Wilfred Scawen Blunt an upper class eccentric poet, adventurer and lover, who wrote love poetry and anti-British Empire tracts including one that was a ‘secret’ diary of the British occupation of Egypt – exactly one hundred years ago. And lovely Word of Mouth will be back in April and again in August. 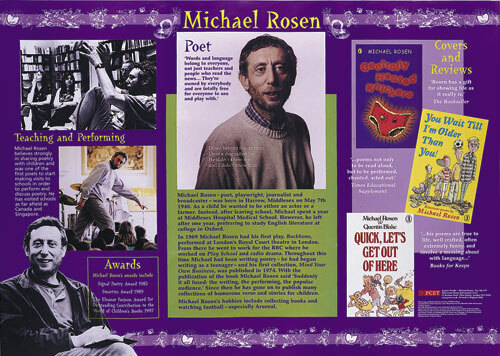 Michael Rosen was born in Harrow, Middlesex in 1946 and was brought up in north-west London in a family where both his parents were teachers and then went on to become academics. He was educated in state schools in Pinner, Harrow Weald and Watford, before starting on studying to be a doctor. That didn’t work out and he studied English Literature and Language at Wadham College, Oxford. 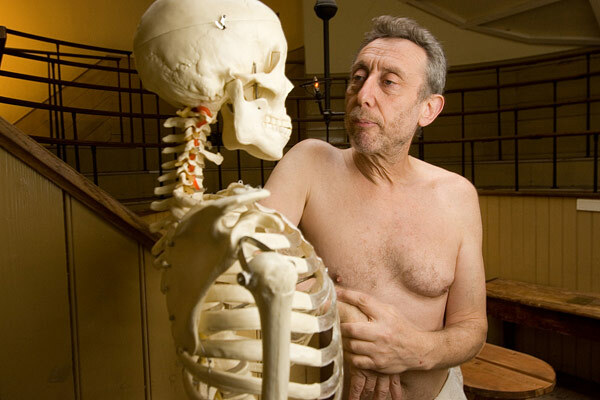 While at university he had a play, ‘Backbone’, performed at the Royal Court Theatre in London. He then went to work at the BBC as a trainee director and producer, whilst writing poems and stories, some of which were broadcast on BBC Schools Radio. These appeared in his first book for children, ‘Mind Your Own Business’, which was published in 1974. Since this time, Michael’s life has been taken up with a mixture of broadcasting, TV work, writing, lecturing, teaching, running workshops and performing his one-man show (a hilarious mix of stand-up comedy, story-telling and poetry) in schools, libraries and theatres all over the country. 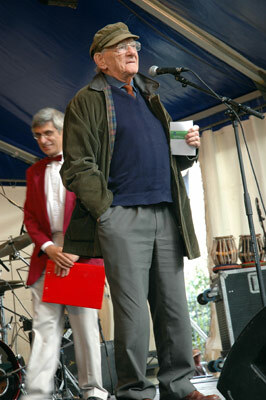 Some of his best known books are ‘We’re Going On A Bear Hunt’ with Helen Oxenbury (an adaptation of an American Summer Camp song); ‘Don’t Put Mustard in the Custard’ with Quentin Blake (poetry); ‘Quick Let’s Get Out of Here’ with Quentin Blake (poetry); ‘Sad Book’ with Quentin Blake (a picture book); ‘Carrying the Elephant’ (prose poems). 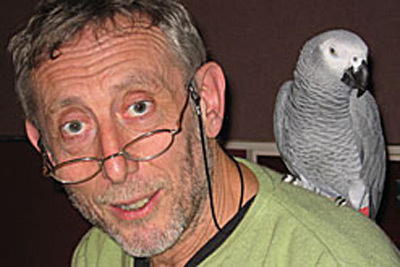 He is the regular presenter of BBC Radio 4’s ‘Word of Mouth’ and appears regularly on arts programmes on television including presenting ‘Michael Rosen’s Treasury of Children’s Literature’ for Channel Five. 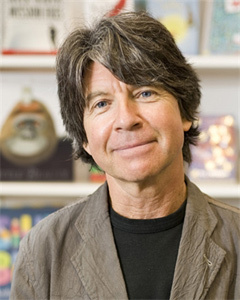 He has been awarded the Eleanor Farjeon Award for outstanding contribution to children’s literature and he won a Sony Gold Award for his series ‘On Saying Goodbye’ for BBC Radio 4. In August 2006 he was the guest on BBC Radio 4’s ‘Desert Island Discs’ and he is a Fellow of the English Association, a Fellow of the Royal Society of Literature and has a M.A. and a Ph.D. in children’s literature. He lives with his family in Dalston in London. Now here are some things I should have put up here ages ago but didn’t because…well, I didn’t know that they were available. Anyway, it’s three sites that have me in walking-talking reality. This one is called ‘History Lesson’ and it’s part of an evening of performance poetry that we put on at the Bloomsbury Theatre, London on the eve of the War in Iraq. It comes from a DVD that’s available from the website, 57 Productions. 1. This is a fun write-up in the Guardian of a nice evening at the Institut Francais in London. 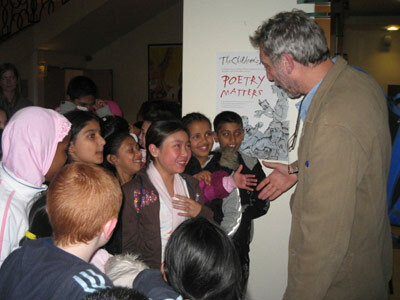 And here is a photo with children from a school in Tower Hamlets who came to the Institut that night. 2. This is a short (very short) interview about green matters also for the Guardian. The fruit is ripe, it’s fantastic. And old bags, made of plastic. There’s plenty on the shelf. As I’ve said before here, I’ve been doing some workshops at the Barbican as part of the Can I Have A Word project and I wrote a poem to go with some photos taken by Henryk Ross in the Lodz Ghetto during the Second World War (here are some of the pictures). Word of Mouth is back. Mondays at 11.00pm, Tuesdays at 4.30pm. The competition we’re running this series is called ‘There Ought To Be A Name For It’ and it’s about coming up with word for some aspect of everyday life that doesn’t have a word to describe it. So, for example, we don’t have a word for those little bits of plastic that you get when you buy a shirt or a jumper, the ones you have to snip off or it’ll end up sticking in your neck. Someone suggested it should be called a ‘teg’. John Lloyd who wrote ‘The Meaning of Liff’ with Douglas Adams (author of ‘The Hitchiker’s Guide to the Galaxy’ and is the person who devised ‘QI’ with Stephen Fry) suggested ‘to birtle’, meaning making something worse when you’re trying to improve something. Anyway, if you fancy entering, make your way to the Word of Mouth website on the www.bbc.co.uk website and over to you. 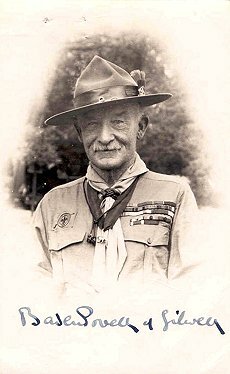 In the meantime, we’re talking about rude words, words for and about diamonds (‘Blood Diamonds’ is doing very well at the box office at the mo) and words to think of for the centenary of the Boy Scouts movement. Dib dib dib and all that – though actually it’s dyb, dyb, dyb…for a very good reason. Both these two theatres have decided to have a go at adapting ‘We’re Going On A Bear Hunt’ for the stage. The Bristol version opens on December 15 and I hope to be seeing it a few days later and the Polka version opens in May 2007. The best thing for anyone who wants to write poetry to do is to read a lot of it. What you need to do is get the hang of the way poetry works, the way it sounds, the way poets put thoughts, ideas and events together. Treat yourself, get yourself one anthology full of poems by different authors, and one collection of poems by a poet you like. Read these two books over and over again. The second thing to do is get yourself a notebook. In this notebook, write down any words, phrases, sentences, snatches of language, notices, jokes, odd thoughts and saying that strike you as interesting. Just keep collecting. Sometimes you may want to copy out part or all of a poem. Sometimes it might be something that your grandmother said, or that you overheard on the bus. Keep all of it. Sometimes you might think it’s interesting how this or that word rhymes or nearly rhymes with another. Jot it down. Sometimes you might have a really odd thought, or you discover that if you re-arrange a well-known phrase something odd comes out. Jot it down. Other times you might discover that if you put two words or two phrases together that usually don’t go together, something interesting happens – like ‘scary’ and ‘tomato’ or ‘sleepy’ and ‘pencil’. Jot them down. That it’s a great idea to write when you feel like writing. Don’t delay it. Don’t put it off. That it’s a good idea to show what you’ve written to people whose views you respect. Some people will be able to help you, others won’t. You’ll find out who these people are by yourself. Poetry is a very wide-ranging field full of many, many different ways of writing, full of very many different things that people have chosen to write about. Don’t ever get yourself into the trap of thinking that poetry can only be one way of writing, or about one kind of subject. That simply isn’t true. Let yourself be open to all kinds. Let yourself be surprised. Always be ready to try out different ways of writing, different subjects. When you read poetry, see if you can spot how the poet has got you interested. Is that something you can do? 1. Without any explanation or questions being asked of the children, just try writing out a poem that interests you on to a very large piece of paper and sticking it up on the wall. You could also put some post-its next to it, telling the children that they could write anything that they want on the post-it to do with the poem. This could be questions that they would like to ask anyone or anything that appears in the poem, or it could be a question that they would like to ask the poet. At a later stage, you could all sit round and look at these slips of paper and see whether people have answers to any of the questions, have anything to say in reply to anything on any of the post-its. They could pretend to be the poet in order to answer the questions directed at the poet. If there were questions that were factual, they could come up with ways of finding these out, eg when did the poet live? 2. If you read a poem to the children and start looking at it in class, see if you can restrict yourself to only asking the children questions that you, the teacher don’t know answers to. So, instead of asking, ‘count the adjectives’, or ‘what kind of poem is this?’ and the like, how about asking ‘does this poem remind you of anything you’ve ever read before?’ (or anything you’ve ever seen on TV or on a film). Does anything in the poem remind you of anything that’s ever happened to you? What kinds of things going on are similar and what kinds of things are different? As with the post-its, what kinds of questions would you like to ask of anyone or anything in the poem and/or of the poet? Is there anyone in the room who would like to have a go at answering these? (It might help to act out an interview here as if, say, you were interviewing Humpty Dumpty about how he felt about no one being able to put him together.) You could ask if anyone can see what I call ‘Secret Strings’. A secret string, is anything that links one word or phrase to any other. As we know, the most common of these is rhyme, but there’s also rhythm, sentence length, repetitions of sound, phrase, image, patterns of various kinds. Quite often, the more you look, the more you find. 3. Poetry swap. This is a deal you can strike with children where you take it in turns to read poems eg teacher reads one, a child reads one. That way you don’t simply keep repeating the same kinds of poem. You could encourage anyone who reads to say why they chose the poem. 4. The Poetry Show. You divide the class up into threes and fours and each group chooses a book of poems and a poem from inside the book. Then in twenty minutes they choose a poem to present to the rest of the class. They can do this in any way they like so it could be reading the whole poem together, or it could be doing a mime and reading all or some of the poem. It could be taking a line or two and making up a song, or a dance to it. It could be dividing the poem up into different voices, solo and chorus. It could be using musical instruments and percussion of some kind. 5. Poem Posters. The children could make poem posters, taking a poem and working out a way of turning it into a poster that could go up on the wall in the school for a while. The more often these change then children in the school get the idea that there are hundreds of poems and you don’t have to just stick with just a few. 6. Using other art forms. Poems are great ways to start work on other art forms, pottery, painting, dance, drama, music and film. They’re great platforms for starting creative work in many different kinds of ways. 7. Notebooks: encourage the children to keep a poetry notebook. Suggest that they can write down any words or phrases that strike them as odd, interesting, difficult, amazing, puzzling, scary etc. If they have an idea for any interesting ways of saying things, jot them down. If they come across a phrase, a verse, a line from anything they’ve read anywhere – poetry, the newspaper, street sign, anything – jot it down. Write out poems or parts of poems in the notebook too. To help them, you can make a ‘public’ notebook that is up on the wall in the classroom, where you can write things that you’ve noticed. 8. I’m sure anyone reading this could think of plenty of other ways of making poetry friendly classrooms and schools. In this context, to talk about ‘writing a poem’ is completely different from the context of a non-poetry friendly classroom where, let’s say, you hope that by reading a single poem, or by using a ‘trick’ from one of the How To Write A Poem books, you can get children to write great poems. If you create a poetry friendly atmosphere, what you do is build up a repertoire of poems in the children’s heads. It’s a resource they’ll use without even knowing why or how. When it comes to writing poems, I suggest that one way to think of is it to ask how can we create a time in which the children can gather some thoughts and ideas that we can use to make poems? One way, is to think that the resources we have at hand are the things we say (if we are in the scene in question) or that other people say to us, the things we can see going on, the things we hear, the things we think, the things we feel, the things we are doing ourselves (if we are in the scene in question). There are many routes to tap into this: using photos, other poems, a title, a situation, a feeling, a memory, a story that I’ve been told, a moment or a scene in a play or a novel, a piece of music and so on. If we ask a question for each of these ‘resources’, as I’ve called them, then we can pool the answers. So, let’s say we started from a situation, like ‘Breakfast Time at Home’, and we ask: ‘What can you see going on?’ You can pool the answers on a big piece of paper and pin that up. Same again for each of the others: saying (you and others), thinking, feeling, seeing going on, doing. So you end up with a series of big posters of all the things that people have come up with. This is a resource you can use to make poems, either class poems or individual ones. You can show either by doing it yourself, or by comparing what you’re doing with poems that have already been written and published, that you can make poems out of each or several of these different ‘resources’. So you could write a ‘seeing’ poem about breakfast. Or a ‘saying’ poem about breakfast. Or you could write a ‘thinking and feeling poem interrupted by ‘hearing”. And so on. There are also ways in which you can introduce patterns to what you’re writing, through rhythm, repetition and chorus. If you’ve got a poetry friendly classroom going then these are the ‘secret strings’ I’ve talked about that you’ve probably started to notice. You can also talk about what I’ve called ‘Impossible Writing’ on the post above called ‘Another Poem’. You can show that you can write things that don’t make sense but in a funny way they do. Take ‘Hey diddle diddle’. A cow jumps over a moon. A dish runs away with the spoon. That’s quite odd and is meant to be a bit funny, perhaps. But you can also do impossible writing about sad, scary or mysterious things. Like ‘the bed started to eat me.’ Or ‘the sky bent down’ or ‘the lemon drove off.’ This gives us another resource, another way of thinking that we can introduce into ‘real’ situations, like breakfast or as a way of writing in itself, say, about autumn, or the market or whatever. In the workshop I did with the children where we looked at the Lodz Ghetto photos, one child wrote ‘…and the leaves called out my name.’ Yes! Using this range of words to describe writing: saying, seeing, hearing, thinking, feeling, and impossible writing, actually gives you a range of very accessible ways of talking about poems that you read. You can spot how poets switch between these different senses. Hello Adam. I find myself laughing a lot at the things I see and hear. So maybe that funny stuff ends up in my poems. Oh Ruby, thank you, but you know everyone is clever at something. Some people are really clever at being nice to other people. Some people are clever at remembering what they did when they were very young. Some people are clever at knowing how to enjoy themselves. There are lots of different ways of being clever. Hello Stan, I’m very sorry, but I’ve never counted. I don’t know! Really! Hi Bertie, I get my ideas from the things I remember, the things I see, the things I hear, the things I say, the things other people say and the things that I imagine. I also get some ideas from the things that I read, or see on TV, in the theatre or at the cinema. Hello Amy. I think poems are good way to remember things, they’re a good way to keep people interested in the way we are the way we are. Sometimes, Oliver, they take ages and ages because I can’t get them to sound right and other times they take just a few minutes. Yes, Sylvie. Best of all I like French tomatoes, chick peas and Turkish cucumbers. Hello Kian. Jeans, t-shirt and a loose sweat shirt or jumper. Hello Isaac. I like some poems by Edward Lear, some poems by Carl Sandburg, some poems by William Shakespeare. Your teacher might be able to find some by these authors and see if you like them too. Yes I do, Sam. My parents did too. They were teachers. So perhaps I got the idea of helping children from them. One show of ‘Never Mind the Full Stops‘ presented by Julian Fellowes. I was on with Ed Stourton, Ian McMillan and Jenni Murray. Great fun had by all. BBC 4 showing in early December, I think. Some interviews to come: one for a programme about the Great British Comic (comic strip, that is, not comedians) and another for a programme about literature and the English village. Both programmes to be shown on BBC 4. Not sure when they’ll be transmitted. Finished filming a 40 minute programme for Teachers TV. It’s about phonics, real books and all that. I will post here as soon as I’ve got a date for that. Meanwhile, Tyne Tees TV, Granada and Border TV ran a series called ‘Seven Stories at Seven Stories‘ – seven programmes using new stories written by seven writers including me. We had a nice time at the Unicorn launching Children’s Book Week. Here is a picture from the day . . .
Here’s a nice site to see what’s happening with poets around the country. I should have put it up earlier but there are still a few dates to come. It may all break as a national scandal (which I hope), or it may just get brushed under the carpet as part of ‘what’s necessary’ in order to get the Olympics done. Not far away, there’s a road called Broadway Market. A film about this will show at the Rio in Dalston at 11.30 pm on November 17 and I helped do the commentary for a film called ‘The Battle of Broadway Market’ which will be showing at The Albion, Goldsmith’s Row, E2 on November 27.
. . . and here are some photos from the event last month . . . It was a great day with music, food, bookstalls, exhibitions and a great chance for people to talk and reminisce. I forgot to mention this properly. This is a little book of photos, poems, notes, cartoons and stories about how I came to write poetry. It’s aimed at KS2 children and is part of Oxford University Press’s Treetops series, non-fiction books for classroom use. To tell the truth, I feel quite proud of this book as it feels like it conveys a lot of what I think I’m about! Two new (but old) books come out this month. Mustard, Custard, Grumble Belly and Gravy is a book made up of two books that went out of print: You Can’t Catch Me and Don’t Put Mustard in the Custard. What Bloomsbury have done, is get me to give titles to all the poems, re-edit some of them, write an introduction and record all the poems for a CD that comes with the book, tucked into the back cover. Quentin Blake as redesigned the book and done some new drawings (including a very jokey one for the last page). This makes me one of those extremely lucky authors who has managed to bring some books that have been out of print back into print. I think Bloomsbury and Quentin have done a magnificent job in producing something that looks and feels so good. Meanwhile, We’re Going On A Bear Hunt goes into its latest incarnation as a pop-up. It’s a great piece of engineering. I’ve just done some filming for the BBC as part of its Learning Zone. Three poets: Kit Wright, Valerie Bloom and myself have been performing our poems to a group of children who were living away from home at Michael Morpurgo’s City Farm in Devon. The ten-year olds were chosen from all over the country and spent a week listening, writing and performing in the company of Cat Francois and Paul Lyalls along with the BBC production team. Anyway, a set of programmes will come out of this which will certainly be broadcast in the Learning Zone, and possibly on CBBC. It was a great day, enlivened by a brief encounter with Kit Wright in the café on Exeter Station. In fact, I have brief encounters with Kit all the time as he lives about three hundred yards from me in east London. Our conversations usually consist of what we’ve just read and been perplexed by. As I had just finished reading John Stubbs’ fascinating book about John Donne, this is what cropped up in the café on Exeter Station. The third series of ‘Reading Aloud’ the programmes I’ve done for Teachers TV are going out this term. Prog 5 Thurs 30 Nov, 1230 hours – why this is a different day and time no one seems able to explain but I’m assured it’s correct! Dates are for each prog’s first tx and from this date the prog becomes downloadable from the TTV website too. And of course the progs will all get repeated but I’m afraid not sure when. A teacher I worked with in Rotherhithe and who is now a lecturer in Canterbury, Andrew Lambirth, has written and article about my work. I don’t think I can give it to you online so here’s the reference. ‘In that tiny world of children’s poetry there was a bit of a ripple. And if ripples can ruffle feathers, that’s what happened’ (M. Rosen, 1998, p. 8). This article will examine the source of this ripple. It seeks to understand the impact of Rosen’s work on children and the discourses that exist within the world of literature written for them. 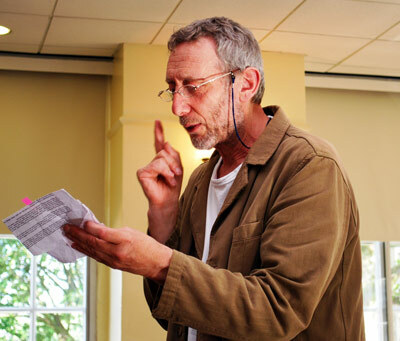 The autobiographical nature of much of Rosen’s writing, the combined effect of free verse, humour and sadness, language play and the dramatically innovative way of portraying family relationships and childhood, forms part of a project for Rosen that advocates personal intellectual liberation. All these elements have been decisive in the success of his work. This paper begins with my own autobiographical thoughts. I’ll be putting in a fleeting appearance on this. At least, I was filmed for it. What went on in the edit, is another matter! BBC Imagine Documentary on Peter Pan and Peter Pan in Scarlet, narrated by Robert Glenister, featuring Daniel Mayes as Peter Pan and Kate Mayberly as Wendy. It’s a documentary by Alan Yentob covering the relationship of J M Barrie and Great Ormond Street Hospital, the history of Peter Pan, the genesis and making of Peter Pan in Scarlet, following Geraldine McCaughrean over the last few months in the build up to publication of her sequel. A nobler grave than this. But I didn’t get the chance. O shucks. Thanks to anyone and everyone who wrote to me after Desert Island Discs and the series I did called ‘On Being Inferior‘. I’m sorry that recordings and transcripts of these aren’t available online. I also hope that one or two people had a chance to hear the little item on ‘Twinkle, Twinkle, Little Star’ that came up on ‘Woman’s Hour’ (BBC Radio 4). A little background: I noticed that this year is the 200th anniversary of the first publication of the song. I told ‘Woman’s Hour’ about it who then put together a really brilliant little feature looking at the music and poetry and talking about the lives of the two women, Jane and Ann Taylor, who were responsible for the poem. If you fancy a listen it is on the BBC website. Photos of a show I did at the National Maritime Museum in Greenwich on July 19. By the way, apart from the odd experience of performing in a perfect eighteenth century echoing hall, surrounded with statues and chandeliers, there was one of those classic ‘school visit’ moments. About two minutes after I started, two teachers came in at the back, sat down and started to make some hats or masks for the children to wear later. This involved using sticky tape adhesive of some sort and pulling it off the reel. As you know, this makes a loud hissing noise, which in this echoing room, filled the air like a gun-shot. In between these noises, the two teachers discussed how they were going to make these hats work, so what was happening was that I was competing with a very loud model-making session. They were quietly ushered out by one of the stewards. If you’ve ever wondered how insurance works, then you need look no further than the jolly time I’ve had with my car insurance. In June, our car was sandwiched between the front wheels of a Hackney Parking Patrol Van, travelling too fast or too wonkily, and the back end of a skip. In other words, the Hackney Patrol Van came round the corner, lost control and drove into the back of our stationary car and shunted it into the skip parked in front of it. Result: one squashed car which was written off. In that lazy, curious way, I wondered if this meant that once the car had gone to the breakers yard, (that’s to say, it had ceased to exist, it was an un-car, a late car, an ex-vehicle) that it would no longer need to be insured. Would I, I wondered, not have to pay any money to the insurance company in order to insure a car that wasn’t a car? Common sense tells us, of course not. Why should I or you have to pay money to an insurance company to insure a vehicle that wasn’t going to crash or be crashed into? In other words, there wasn’t a vehicle that posed any kind of risk to my insurance company. But no no no, the insurance company will go on deducting my monthly insurance premium from my account to cover a car that doesn’t exist. Hey, that’s insurance! Guardian article on books, libraries, reading and computers. It’s by Chris Arnot who interviewed me. Letter to the Guardian here. Here’s a really interesting website for people studying or teaching A-level language courses. 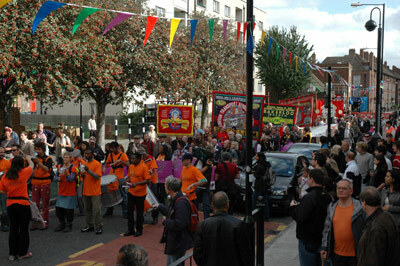 Barry from Hackney Library was snapping away again this year. Here’s his handiwork. I’m beginning to worry that I’ve only got one shirt. Barry also, very kindly, sent me a link to the BBC messageboard where someone has told a story about me from 1969 (true). The only mystery is why a conversation about Desert Island Discs and its guest ended up on the messageboard for ‘The Archers’! I missed that – must LA if it’s still on. He was at Oxford the same time as me – one of those very well-known faces because he always seemed to be on the brink of getting into trouble, anti-establishment, a total wild child. I was so surprised when later he became such a cosy uncle-style figure for little children. We had a sort of uniform called sub-fusc which was worn on very rare occasions like matriculating and graduating and formal exams. For the men it was a black suit and white shirt, white bow tie, mortar board and gown and generally they would add a white carnation. I remember seeing MR on his way to the examination schools wearing black jeans, a short black denim jacket, a bit of white rag knotted round his neck that looked suspiciously like an old bandage, and a piece of paper in his – well, where the buttonhole should be, anyway – with the words ‘a carnation’ written on it. In the spring, I’ll be tutoring a module in Children’s Literature for a Birkbeck College, University of London, MA. Students enrolled for their MAs in modern literature and culture will be able to take it for an option. Details will go up on Birkbeck’s website fairly soon. ….is back for the summer. I won’t be doing the first two in the series, which begins on Monday August 7 at the new time of 11 o’clock at night, with the repeat going out on the next day at 4.00pm. Standby for some items on such things as body parts, words that haven’t been invented yet, cabbies’ lingo and much, much more. 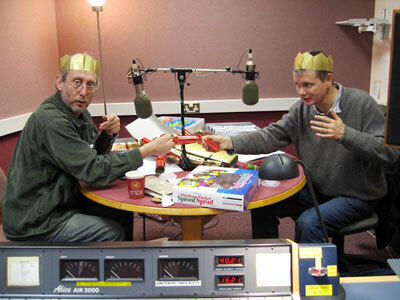 The peculiar thing about making the kind of radio programmes I get involved with is the silence. You sit in a room that is deliberately deadened so that there is no trace of echo or resonance and you talk to a microphone. Quite literally. You have to think of the microphone as a person’s ear. And unlike ordinary conversations or performances in a theatre you have no sense of feedback at all. If the producer or the studio manager are enjoying it, you can’t hear or (if you’re looking down at your script) see how they’re reacting. And then there’s the after-silence. Very few radio programmes are reviewed or discussed elsewhere. Your family and friends may well have missed the programme, so unlike writing a book, or doing a show, there’s a non-response. A gap. A nowhere. So in a way, it’s hard to place or position what you’re doing. You just have a sense of it happening and going on happening. This isn’t a complaint, just a description. Anyway, being accosted on Kings Cross Station and being offered a micro-glimpse into how the programme is received, revivifies the whole process. We’re Going On A Bear Hunt in glorious pop-up form is coming out on the same day as Mustard, Custard, Grumble Belly and Gravy. The Bear Hunt book is a beast. It’s huge. You can almost get into it and go through the forest (my favourite page) and through the snowstorm. Some people might be sad that you don’t get Helen Oxenbury’s marvellous picture of the bear slouching back to his cave on the last page. There wasn’t room for it, I’m afraid. That’ll just have to be an interesting extra bit, that people find in the other editions. By the way, I got a phone call from my brother-in-law telling me that Bear Hunt appeared on, wait for it, Coronation Street. Oh yes, it seems as if the Doctor (sorry I’m not up with Corry. It’s East Enders for me, if I’m feeling soapy) was reading a book to his son?/daughter? and, yes, it was Bear Hunt that he was reading. This matches my other ‘appearance’ when a few months ago, Kimberley from (is it Girls Aloud?) was on the Frank Skinner Show. They showed her as a four year old sitting in the toilet and performing a poem called ‘I’m Finished’. My step-daughter saw it and was pleasingly angry on my behalf that they didn’t credit me for having written ‘I’m Finished’. I should say here that my children are not swots on works by MR, and no reason why they should, but it just so happens that ‘I’m Finished’ is about the step-daughter who was watching the Frank Skinner Show. So, how come four year old Kimberley was performing the poem? Because we filmed it as a Schools TV show many years ago, and the Skinner Show people, or Kimberley’s press gang, must have dug it out. Meanwhile, back with October 3rd, Mustard, Custard, Grumble Belly and Gravy is the book that combines Don’t Put Mustard In The Custard (out of print) with You Can’t Catch Me (also out of print). There they are in one volume, with a wonderful new cover by Quentin Blake, an extra pic or two through the book and a good joke at the back. And it comes with an intro by me and a CD that I’ve recorded too. So October 3rd will in effect be re-hash day when two books come out which are in effect re-hashes of three books I’ve already produced. So October, will see me as some kind of reheated spag bol; a tyre that’s had a retread; an engine that’s had a recon; a suit that’s been to the dry cleaners. This website, tells the story of what’s happening (or not) to the Oxford Story Museum. I wrote a poem for the launch of it, and it appears on this website with an explanation. It’s meant to be a poem with clues, where you have to guess which book I’m talking about…If you come across a blank page under the heading ‘Story Museum’ I think this is possibly a joke. I mean it’s a joke if you’ve ever read ‘Tristram Shandy’. These three websites have a long ballad I wrote for a celebration of the life of a Norman outlaw. I read it at the castle from which he was banished, and to which he eventually returned. You’ll be asked things about who it was, how you felt about it, did you go along with it, or did you find ways to resist what was said or done to you? We’re not looking for celebs. Just anyone with an interesting story to tell which would allow people to see that their own situation isn’t unique and that the processes of put-downs and those who have been put down accepting it and fighting against it are only too common. I’ll be presenting a series of four programmes on the subject for Radio 4, starting in August. A few years ago, I was asked to run some workshops with students studying animation at the Royal College of Art. One of the students, Sam Morrison, was making a cartoon film about a laconic sort of a bloke called Henry who didn’t understand why he wasn’t getting on with his partner who, in turn, didn’t seem to enjoy the way Henry practised heading a football in the front room. Sam asked me to do the commentary and a year or so later, late at night, I was in the kitchen and one of my kids started shouting from the other room: ‘You’re on the telly, Dad!’ I rushed in, expecting to see my mug on the box, but no, it was Henry, and there was my voice. Sam had got a showing for Henry on BBC 2. Well, I got a note from Sam the other day saying that he was doing a sequel. Henry is now working in an office developing greetings cards. He has a great idea. Except it’s not so great. I don’t want to give anything else away. I’ve just recorded the sound track for the film, so maybe in a year or so’s time, it’ll be around midnight, I’ll be in the kitchen, and one of my kids will shout out, ‘You’re on the…’ Yes, yes, you can guess the rest. Anyway, this Sam Morrison bloke is a blatantly talented young geezer. He writes, draws and rides a motorbike. He’s even getting married soon. All that, huh? And so young. And everyone joined in roaring it out. Oooh it was seriously good fun. I should have some photos of it coming my way soon. These things take some time to cook, it seems, so I’ll have to wait a bit longer for them. I did a talk at Kings College, London for the education department. They have an annual lecture – the dearly beloved and sadly departed Ted Wragg did it just before he died, so I was hoping it wouldn’t do for me. It’ll be going up on their website very soon. In the meantime, here it is. Fulcrum TV is a film company I worked with to help produce the tribute video for Paul Foot. I mc’d the memorial concert and Fulcrum brought out a video of it. Now they’ve put together the story of how people in Hackney, where I live are fighting to keep the houses and shops in Broadway Market out of the hands of developers. It’s a long and sordid history, reproduced in other parts of Hackney, other parts of the UK and other parts of the world. 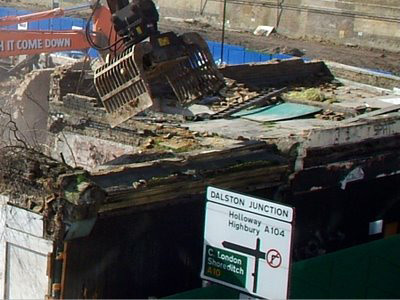 Quite simply, local government agencies encourage big business to come into run-down communities, wipe out all local initiatives and local buildings and bung up luxury flats, or buy-to-rent places and call it ‘regeneration’. Quite often, it doesn’t ‘regenerate’ anything. All it ends up doing is tricking and evicting long-standing tenants, often of migrant origins, subsidising some mammoth project that no local people ever asked for, and putting in high-rent payers who don’t stay in the area and are often only living there part-time. Anyway, Fulcrum asked if I’d do the commentary for the film. They haven’t managed to sell it yet, but here’s fingers crossed. 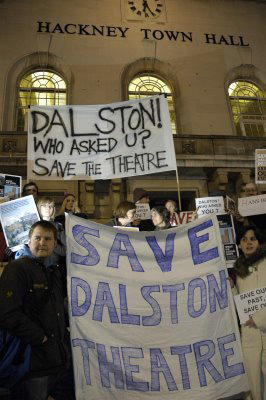 There are two websites telling the story of what’s happening in the two sites I know of, Broadway Market and Dalston. Bloomsbury are bringing out a combined edition of ‘Don’t Put Mustard in the Custard‘ and ‘You Can’t Catch Me‘. It’s going to be called ‘Mustard, Custard, Grumble Belly and Gravy‘. Quentin Blake has done a brand new cover and very jokey end picture and the poems have been re-titled, slightly altered to fit the way I tend to perform them. With the book, there’s a CD of me reading all the poems and it comes out on October 3. Meanwhile, Walker Books are bringing out a pop-up version of ‘We’re Going On A Bear Hunt‘ on the same day. I’ve got a couple of pre-publication copies and it is an extraordinary feat of engineering. My favourite spread is the one where the family are running through the forest – ‘Stumble trip, stumble trip’. You have a real sense of depth and movement. 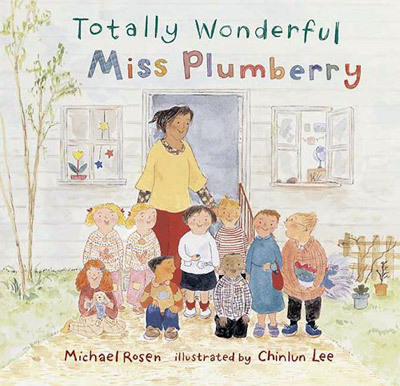 Before that, Walker are bringing out a picture book I’ve done with Chinlun Lee called ‘Totally Wonderful Miss Plumberry‘. It is due for release on July 3rd and Amazon have a short preview and synopsis. October or November – Lecturer Piers Bilston and I are planning a Literature is Fun conference at London Metropolitan University. We’re hoping to bring together practitioners and teachers who have any experience of aiding the enjoyment of books in schools. All exams and tests banned. We’re looking for people who’ve worked in any of the arts in relation to books, or found interesting and exciting ways of simply enjoying literature in schools. We hope that the day itself will be enjoyable with plenty of stories, drama, music, art and performance and people will come away from it, full of ideas of what they can do the very next day with their classes and groups. Look out for a poster and/or leaflet coming round in September. Watch this space for more info. It occurred to me that in the present context of what’s going on in English teaching in primary and secondary schools, this is perhaps the most subversive and dangerous thing to do. Literature and literacy have become a focal point for the maximum amount of anxiety about correctness, standards, grading and league tables. In fact, literature has become the handmaiden to literacy with the result that reading for enjoyment has slipped off the dial. Whenever kids are asked to open a book of fiction or poetry, they know that within seconds they are going to be asked questions about it. In the past, I think I’ve been quite partial to the idea that there are some interesting questions to ask of books in education, but in the present context in which every question is part of the programme that leads to SATs, which in turn are part of the school league tables, I’ve come to the conclusion that literature is being forced into a vicious grading system that works against the impulse of what books, fiction and poetry are for. With this in mind, I’m hoping that more and more people will want to set up workshops, conferences, festivals, symposia or whatever which are about nothing more nor less than the sheer enjoyment of literature. I put on a Performance at the University of Hertfordshire for local schools on February 8th. Here are some of the Photos from the day. The headteacher of Columbia Primary School in east London is retiring. Penny Bentley was the head when two of my kids were at the school and I worked alongside her when she was a classroom teacher at John Scurr School, just down the road from Columbia. She ran the school with a great vision, rigour, persistence and commitment. She won loyalty from the staff and I’ve always enjoyed working in the school because of a whole school belief that the arts was a way in which children could develop a sense of themselves as people and a sense of themselves as a community (or communities) of people working together in a school. A couple of years ago, I worked alongside a group of animators and together we devised a whole school CD-Rom and show that brought together the children’s art-work, animations, poetry, music and performances. We used the general theme of water and a group of poets came in and all together, (that’s every class) worked up this great artistic venture. It was brilliant. That needed a whole school commitment to something like that, and that can only come if a headteacher puts their weight behind it and believes in it. In my experience, there are not many headteachers who will do this. Penny has been one of them. She has also been a great friend to my family and I’ll never forget how wonderfully she acted as MC at the funeral of my son Eddie. She told the story of his life and introduced everyone calmly and yet full of sympathy and emotion. It was brilliant. I’ve recently been filming in the old Whitechapel Libary for The Culture Show (BBC 2). Here are some shots from the shoot! Meanwhile, I can report that I had a great time at Hackney Central Library doing a reading for Jewish Book Week. What an interesting mix of people. I wondered if it be one of those occasions that people would feel that they could only go if they were Jewish. But no, there were plenty of people there who were most definitely not Jewish so it was a very open, free atmosphere. It was also all-ages. A woman on the front row who had been to hear a reading given by my father in the Voice Box at London’s South Bank told me that she was two years older than him – so that made her 88 or 89. And there were children there down to as young as seven year olds. One of the poems I read comes from one of my prose poem books for Penguin and it’s about how Eddie used to tell a joke about a man with an orange for a head. His head was an orange. But I couldn’t remember the joke. The joke’s gone. It was one of those questions that no adult would ask, but went right to the heart of the poem, the emotion and meaning behind the poem. Brilliant. Brilliant. Another series of Word of Mouth comes to an end with a hilarious and enjoyable coin-an-aphorism competition and a session where Matt Harvey and I pulled Christmas crackers and discussed the jokes (see picture below). Yes, it gets that high-brow. 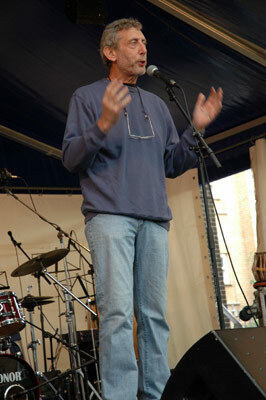 Incidentally, The king of aphorisms who judged the competition on Word of Mouth was James Geary. Here’s his site: jamesgeary.com/blog. We’re back in April on Tuesdays (not Friday’s anymore) at 4.00pm and Sundays still at 8.30pm. In between, I’ve narrated a programme about step-families called Steps. 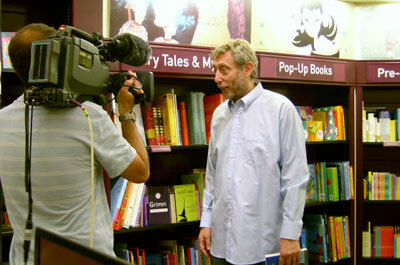 I appear briefly (I think) in a programme on the history of Jackanory, coming up soon. My top Jackanory of all-time has to be Kathy Burke doing The Twits. Wonderful, though Alan Bennett doing Winnie the Pooh had that strange, nostalgic, endless sweep of the middle class running through it. How does he do it? I’m in The Culture Show (BBC2) of Feb 2, looking at the Whitechapel library of old and comparing it with the new Idea Store that’s 500 yards down the road. My father used the old one and its Norman Lebrecht’s argument that the new institution is a betrayal of all that was good about the old one. We meet and dispute the matter. In September I’m writing and presenting a series for Radio 4 called On Being Inferior. The programme for Radio 4 about Lewis Carroll, CS Lewis, J.R.R Tolkien and Philip Pullman all being amongst the world’s most popular fantasy writers and all coming from and living in and near Oxford, goes out in April. The photos here show me faffing about in Oxford trying to find out if there’s a thesis here or not. The man I’m standing with is, Ron, the childhood friend of C.S.Lewis’s step-son Doug. 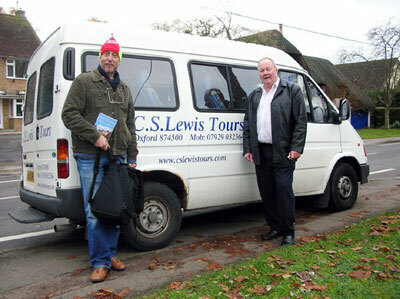 They used to play together in the grounds of CS Lewis’s house. The guide at Christchurch College Oxford standing in front of the little door that Lewis Carroll used to look at and watch Alice peering through, wishing that she could go into the garden beyond. 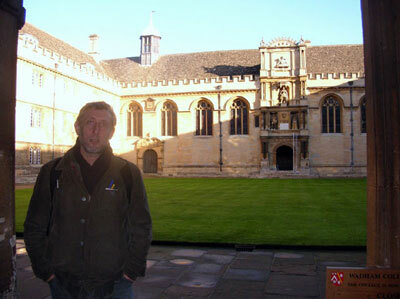 This is me at my old college, Wadham. First time I’ve been there since 1969! Mixed feelings. 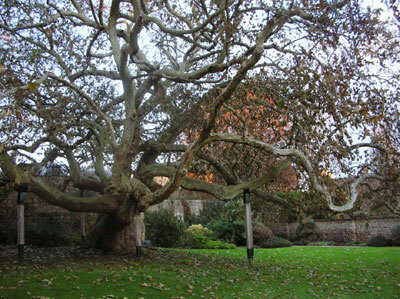 This is the first Asian plane tree ever to be brought to Britain, and its branches inspired Lewis Carroll to create the Jabberwock. It’s in the garden of Christchurch College. I’ve got a new book out. It’s called Dickens: His Work and His World, illustrated brilliantly by an Australian guy called Robert Ingpen – no relation of Mick Inkpen – well it wouldn’t be, would it, because Ingpen and Inkpen are different names. 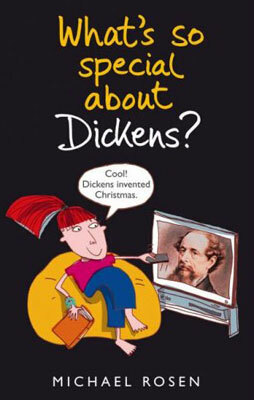 Anyway, the book is about the life of Charles Dickens and how he came to writer such brilliant books. If you read it, I hope you enjoy it. 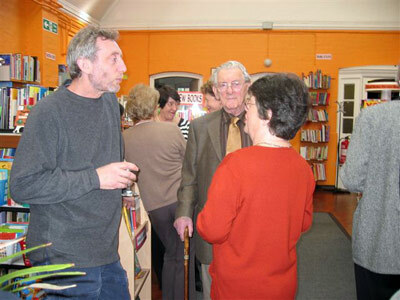 Finally, here are some pictures of me doing my stuff in my local library. Big thanks to Barry for sending them to me. Doing Home Truths on Radio 4 is like being taken into the rooms of complete strangers and being shown things that really matter to them. Over and over again. On the first day I was in the BBC to do it, I had five interviews to do in one morning. Mostly, you don’t actually see the person you’re talking to, they’re in a studio somewhere else. I find myself staring at a piece of paper or the clock immediately in front of me so that I can concentrate on what they’re saying. And, you know, when you wear earphones, there’s a way in which the sound of what you’re hearing feels like it’s in the middle of your head. I mean, it doesn’t sound as if it’s coming through your ears but is somehow in your brain without having to get there through your ears. All this means that it feels as if you are very close to the person you’re talking to. Well, if that happens five times in a morning, it’s quite bewildering. I had to have a good munch on a chicken salad sandwich after that. Anyway, it’s a fantastic programme to be working on, because the more you do it, the more you realise that the series as a whole tells the story of how we live now and how we have lived for the past fifty years or more. It doesn’t tell it in the ‘great sweep of history’ way, but more as fragments and episodes. This chimes with me because it’s exactly how I’ve been trying to write for the last thirty years or so! The evenings at the Barbican were really interesting. The exhibition is a mixture of very abstract looks at the idea of colour and various installations. This means that nothing tells a story or shows colourful things as such. You might have thought that this would mean that there’s not much to write about. Not so! People had plenty to connect with. I wrote about a fire extinguisher. The fire extinguisher isn’t actually in the exhibition. It’s on the wall next to an installation called ‘Red Room (Child)‘ by the great surrealist artist Louise Bourgeois. You look in through a window and see a lot of slightly disturbing red things, like two red hands holding each other. I found myself attention caught by the fire extinguisher that was next to the work of art and somehow it all connected with a slightly disturbing event from my childhood when a boy broke into school and squirted a fire extinguisher all over the place. When I’ve polished it up a bit more, I’ll put it up on the site. The Open University very kindly gave me an Honorary Doctorate. This is like a prize – their way of appreciating someone’s work. It all took place at the Festival Hall in London, at the same time as the people who’ve studied for their degrees come to get their certificates. I had to dress up in a blue and yellow gown (Arsenal ‘away’ strip, really) and process. This means walking very slowly behind the bigwigs from the university down through the audience and up on to the stage. I should also say that the hall is not only full of students but also their friends and family. There were about 2000 people there. It was very friendly, and before it all got going, a man took us through what would happen, and we had to rehearse, standing up, sitting down, bowing, turning, going over to a book and signing our names, coming back, sitting down and the like. It all seemed quite straightforward. Then we had a very nice lunch overlooking the London Eye. After that, it was the procession, up onto the stage, and wait my turn for the ceremony. You’ll never guess what happened: at the crucial moment, just as I’m about to be given the certificate, I turned the wrong way, and, in front of 2000 people headed off the wrong way across the stage. So the Director of Studies was left standing there with my certificate in his hand while I wandered off. The good thing about the occasion, is that this didn’t seem to matter. Thanks very much, Open University. I opened the Rosen Reading Room at Edmund Waller Primary School. Of course, it could just possibly be named after all the other Michael Rosens there are in the world . 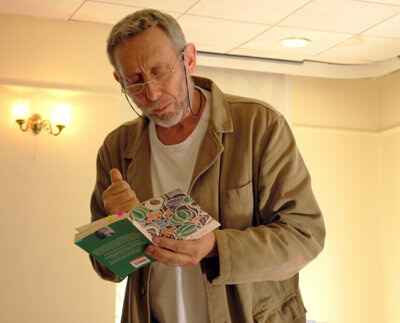 . . like Charles Rosen, the word expert on music (no relation of mine), Michael Rosen, the world famous philosopher (not me), Michael J. Rosen, the world famous writer of children’s books (not me – a very nice American guy from Ohio who I met once. I’m Michael Wayne Rosen, so we’re not the same people), Michael Rosen, the professor of percussion (not me), Michael Rosen, the world famous record producer and one-time performer in the folk-rock band Eclection (not me), Michael Rosen, the world famous expert in how to put people to sleep (not me, though I tend to put my family to sleep. This guy is an anaesthetist.) And there are others, believe me. Then they played a piece of music called Fanfare for the Common People (or was it the Common Man? I’m not very good on titles.) It was by Aaron Copeland. And when the drum rolls sounded out, it made people jump. The head said that he had chosen that piece because ‘we’re all equal. Think about it.’ I did. After the ceremony, they served up CHOCOLATE CAKE. Good, or what? And then the headteacher showed me a kind of huge tree house-walkway thing that they’re constructing. They’re going to have to put up a sonar device to keep the foxes away, otherwise they’ll burrow underneath it all. I once saw a fox when I was going to see Arsenal play. As foxes are red, I wondered if it was a supporter. So, thanks very, very, very much to Edmund Waller School. 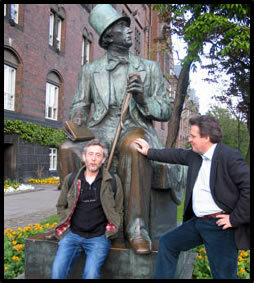 I had a fantastic time in Copenhagen and Odense, the birthplace of Hans Christian Andersen. Do you know how you say Andersen in Danish? You say, Annasen. I went with Lars Tharp and the BBC producer, Marya Burgess. You may have seen Lars on the Antiques Road Show. He was born in Denmark but left when he was six. He was great company and told all sorts of stories about Denmark, his parents and grandparents and we saw where Andersen was born, where he walked about in the city and I ate tons and tons of pickled herring. Lars likes Denmark and Danish food but I think even he was a bit amazed to see me eat pickled herring for lunch, tea, late evening snack and, wait for it, breakfast! Believe me, Danish pickled herring is one of the great delicacies of the world, especially with rye bread. It’s a pity that the sound of me wolfing down pickled herring won’t appear in the radio programme that we were supposed to be making. 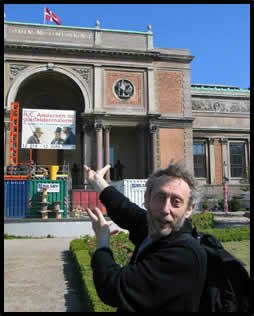 On the way into the State Art Gallery where they were showing paintings of Italy from the time Andersen travelled there. 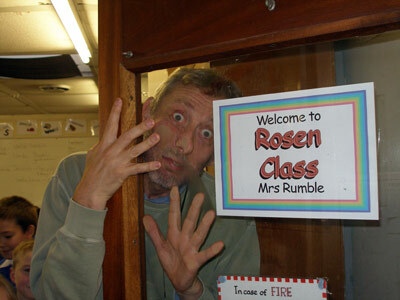 At a primary school in south London called Edmund Waller they’re going to make a Michael Rosen Reading Room. Wow! a compliment or what? I’m honoured. In fact I’m so chuffed about it I’m going to go there to launch it. (Is that what you do to a reading room?) Anyway, if you see me around Peckham on June 8th with a big silly grin on my face, it’s because I’ve been opening my reading room. Perhaps they’ll let me read a book in my reading room, what do you think? Anyway, in the end, I found quite a lot, shoved it in a box and a courier came to pick it up on May 18. I found the first manuscripts that I wrote for my two novels: You’re Thinking About Doughnuts and You’re Thinking About Tomatoes; the first drafts for some of the Eddie poems and the first draft for The Sad Book. It will all go into the archive at Seven Stories where anyone who wants to look at them can go and see them. And they can use them for their exhibitions or eventually, make files of them and put them up on their website. This is the name of a book I’m doing for Oxford University Press that will show how I write and how I got into writing. I’m right in the middle of it now. Yesterday, I was writing ‘speech bubbles’ with arrows that lead to lines of poems from Quick Let’s Get Out Of Here and You Wait Till I’m Older Than You. In the bubbles, it says things about what made me write like that, or what I think about the person who said this or that, or suggestions for how you could read it out loud. Next, I’ve got to write about what it was like growing up in Pinner and what kind of person I was. My old school friends, some of whom appear in my books, had a reunion this month. Sadly, I couldn’t get to it, but one of the boys in my class has kept an old school magazine that we made and he sent me some it on an email. From Class 3 (I think I was about nine), there’s an article by me about going to the Natural History Museum and joining the Junior Naturalists Club. I’ll try and put it up on this site soon. I have to say, it’s not the liveliest bit of writing I’ve ever read!!! 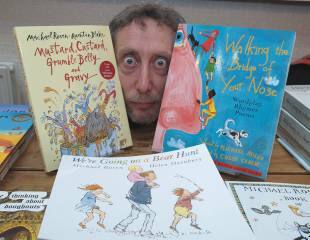 Quentin Blake who did the wonderful pictures for Sad Book has been shortlisted for the Kate Greenaway Award for the work he did on the book. The book has also won the Exceptional Award in the English 4-11 in the category for the Best Children’s Illustrated Books of 2004 given by the English Association. The new museum of children’s literature called Seven Stories, which will be opening later in the year in Gateshead, has asked me to get together some drafts of poems and stories to go in their archive. This means going through piles of old papers and pulling out some things that people might find interesting – scribbles, notes, ideas, that sort of thing. Then they’ll carefully unravel it all, put them into folders, explaining what each bit of paper was for. They may even put one or two on display: my scribbles as part of an exhibition! PCET have kindly reminded me that they have a poster of me available. You can view and order it here. I’ve finally become a museum exhibit. Hackney Museum is running an exhibition of people who live in Hackney and like it. 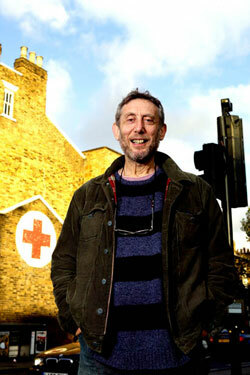 So they took this shot of me standing by the Red Cross’s painting on the wall, which I remember from my childhood. It seemed so big then, as I went to see my grandparents, known to me by the Yiddish words Bubbe and Zeyde, grandma and grandad. Anyway, I’ve lived for twenty years only a hundred yards from this red cross, so it seemed kind of right to have it in the pic of me. We’ve just finished filming the second series of this programme that goes out on Teachers TV. People say to me, what is Teachers TV? Where is it? When is it? TTV is an independent TV station funded by the government but independent from it, managed by an old acquaintance of mine, Andrew Bethell. I’m not sure who gets it on their TV sets but I get it via digital TV that is piped into our house via cable. It comes in on channel 240. Reading Aloud is a fifteen minute programme about books that teachers can use in the classroom but also included a segment that is a discussion about any book that people in education might enjoy reading. This might be because it has educational interest, like Howard Gardner’s ‘Multiple Intelligences‘ book, or because, in some general way, it might interest the human being who happens to be a teacher – a book like ‘Spies‘ by Michael Frayn, ‘The Rainbow‘ by D.H. Lawrence. When we’re looking at books that teachers might want to use in the classroom, the programme takes a look at what a teacher has actually done with the children he or she has been teaching, and then I have a conversation with that teacher where he or she explains why and how they came to do what they did. We also talk to individual writers like Jacqueline Wilson or Malory Blackman and look at any activity that might interest teachers interested in reading matters, like say, West Bromwich Albion Football Club’s literacy initiative. We don’t film in a studio but Waterstone’s in Birmingham let us use their store to shoot all the ‘links’ from there. This means I do a lot of talking and walking round bookshelves, in and out of the shop, or creeping round the pillars and arches of the store. The building itself is quite an oddity. It used to be a bank and was clearly built in the grand style that banks in the nineteenth century believed helped create the correct reverence for filthy lucre. As you can see from the pix, I’m clad in a particularly fetching shirt, supplied by the great little outfit that put the show together, Television Junction. You can see them in the group shot being singularly unself-conscious, ahem ahem. (Many thanks to Rebecca from the Television Junction team for the photographs. I’ve also just finished another run of Home Truths. People keep saying to me, who’s going to take over from John Peel? Or, we heard that it was going to be Fi Glover. Would you do it, if they offered it to you? And so on and so on. All I can say is that the BBC likes to do things in its own sedate way. They didn’t think that there was anyone who could or should just walk straight into John’s shoes. They liked (and still do) the differences that the four main presenters and the several occasional presenters bring to the show. At present, I’m not aware of any decision having been made. That’s to say, it might carry on as it is at the moment, a single presenter might be chosen, that presenter might be someone from the present team, or not! To tell the truth, I don’t even know if the show itself is going to carry on. When people say to me, but that’s not very good, is it? I both think and say, but that’s showbiz. The entertainment business operates like that. It’s very much a hire-and-fire kind of place. One moment, people might like this or that show, this or that format, this or that line-up or presenter and the next, they might cool. No one has a meal ticket for life, no one can assume that any bit of work you do, is a guarantee that the channel, or the execs will want anymore. What’s more, you can never be sure that what you do or have done is actually very good. It might just be OK and no one has told you that that is all that is. If anyone working in the business doesn’t like that way of going on, the best thing to do is look for another job. On December 1, Britain’s first purpose-built theatre for children was opened and I was lucky enough to MC a kind of curtain-raiser show. It was a way of saying to all the money-bags who had helped finance the place and I was introducing John Hegley, Adrian Mitchell, Jan Blake, and Amina Khayyam. The artistic director is Tony Graham and he finished off the occasion. It’s taken 45 years to get to this point, the Unicorn having started out as a roadshow inspired by a kids theatre fanatic, Caryl Jenner. They were housed for many years in a the Arts Theatre, just off Charing Cross Road, and then, while this new theatre was being built, in a temporary outfit called the Pleasance, in Islington. I got a bit of a rise out of Tony in the compere-ing about this time in the Pleasance, because you could never find the place. It was stuck somewhere between two factories on an industrial estate near Pentonville Prison! Anyway, great occasion, wonderful place – and the theatre itself beautifully designed, with all the audience really near to the stage. Get down there quick, quick, quick! It’s on Tooley Street, which is very close to London Bridge Station. If you know where the London Dungeon is, then all you have to do is carry on walking down Tooley Street for about another fifty yards and there it is, on the other side of the road. ‘Waiting for Jamie Oliver: beyond bog-standard literacy‘ with articles by Bernard Ashley, Quentin Blake, Michael Morpurgo, Chris Powling, Alison Prince, Philip Pullman, Michael Rosen and Jacqueline Wilson published by that National Centre for Language and Literacy. It’s a great little booklet, firing a salvo off at the literacy programme presently installed in primary schools. Hurrah for Chris Powling and Bernard Ashley in particular for putting in all the effort to get this thing out. We had coverage in the Guardian Education section in November. You’ll find the article through the search engine on the Guardian website. 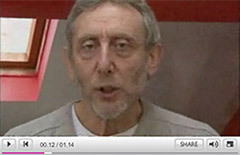 FILM 5 Defending the Faith-Debate (Duration 22mins) Michael Rosen, poet and atheist, takes on the religious convictions of a group of Roman Catholic 6th form students.The debate includes; science versus theology for understanding the origins of the universe, faith and life style, questioning the doctrine, is God on everyone’s side? the Holy Ghost and the supernatural, saints and shrines, disasters and suffering. 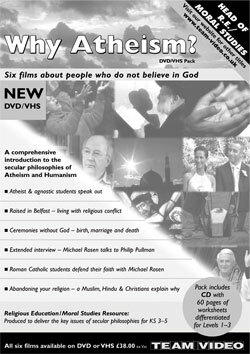 Engaging and challenging, non-believers and believers of all faiths will find their views tested.